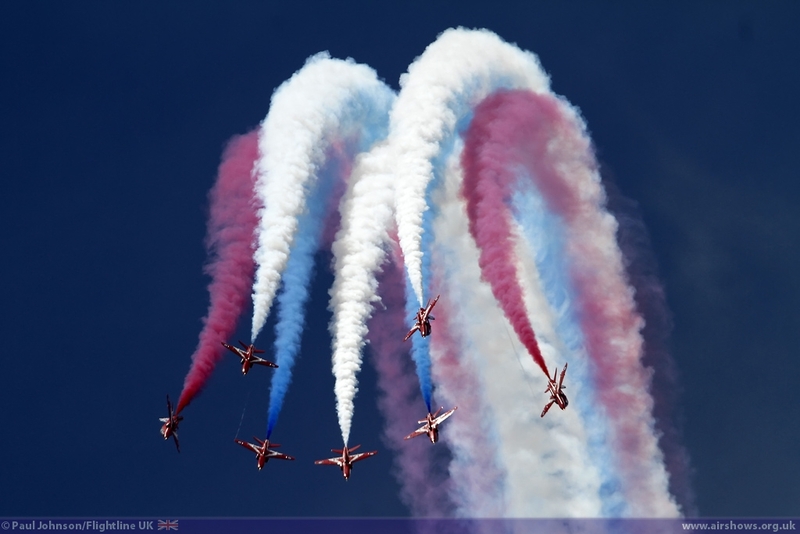 This year's Royal International Air Tattoo at RAF Fairford celebrated the 50th Display Season of the Red Arrows as its main theme with a new three day format starting with a special public "Pit Day" on the Friday afternoon. 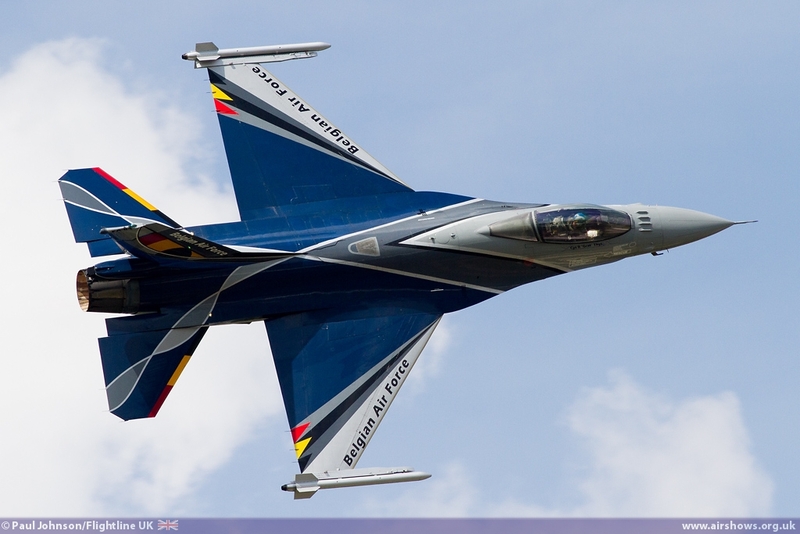 Others themes included "Partnership" plus the 40th Anniversary of the F-16 Fighting Falcon and the Hawk jet. 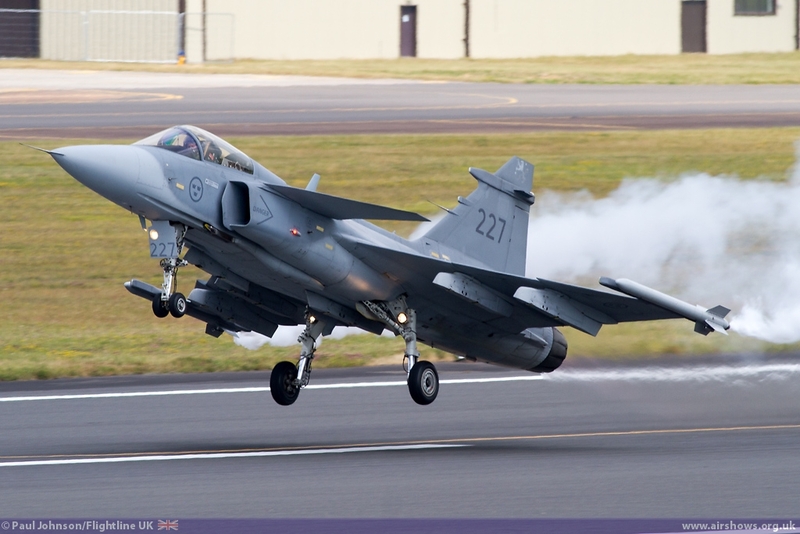 The event also saw participation from around the world with participants from Japan and the United States joining more familiar participating nations from Europe for the three day military aviation festival. 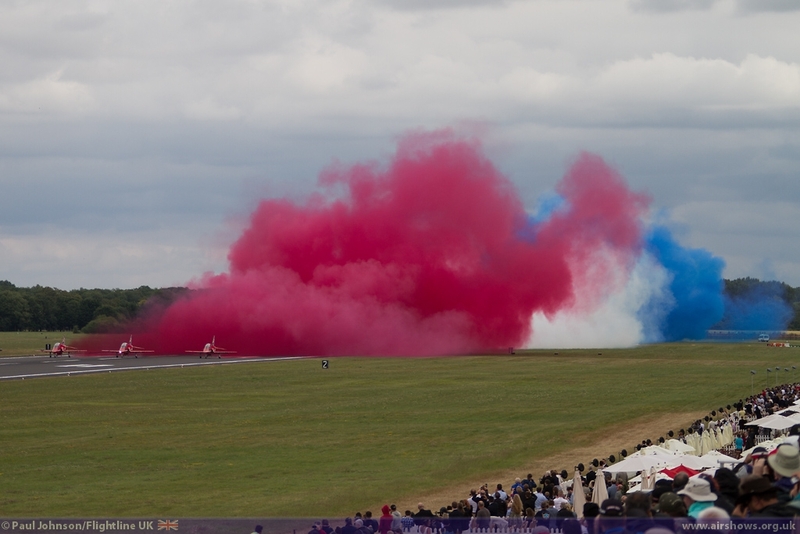 The Royal International Air Tattoo may have had the main aim of celebrating the Red Arrows 50th Display Season, but the headlines from the event were made by an aircraft that was unable to attend - the Lockheed Martin F-35B Lightning II Joint Strike Fighter. 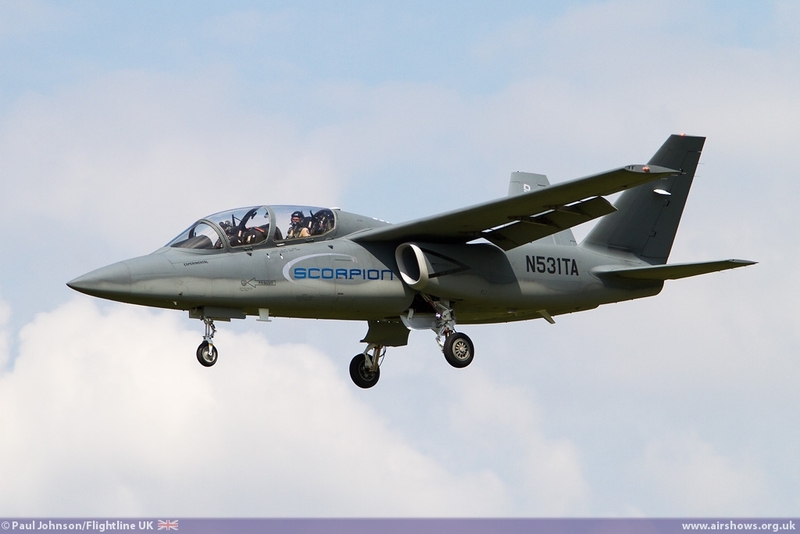 The aircraft, still really in its operational evaluation phase of development was due to deploy for its first overseas visit with three United States Marine Corps aircraft flying with one of the UK MoD's F-35Bs to perform "role demonstrations" at Fairford and Farnborough. 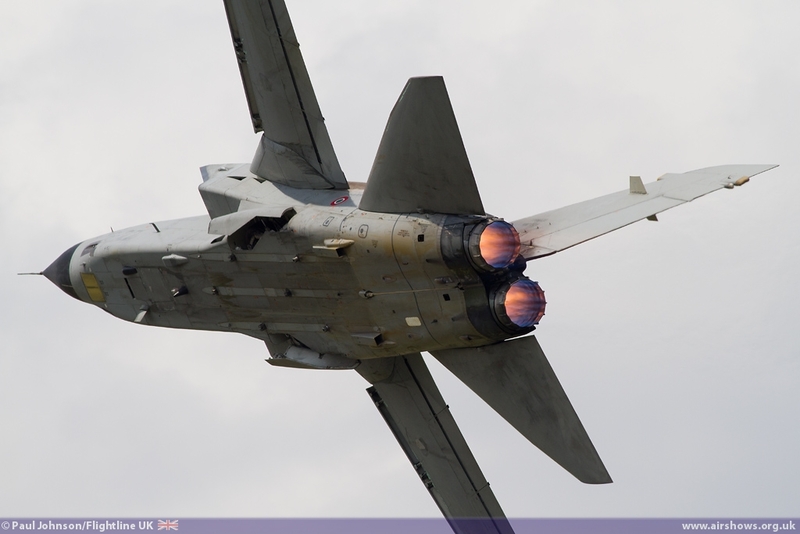 However in the weeks leading up to the event, one of the United States Air Force F-35A suffered a major engine fire which eventually led to the suspension of flight operations by all variants of the F-35. The days slipped by with three USMC sitting at a US Navy base on the Eastern coast of the US waiting to make the crossing. 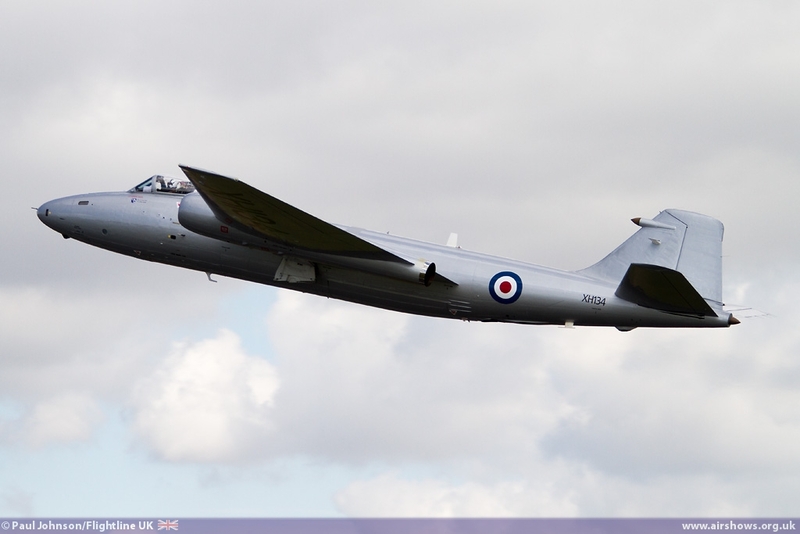 Sadly for all involved, the aircraft were not permitted to make the trip in time for either Fairford or Farnborough. 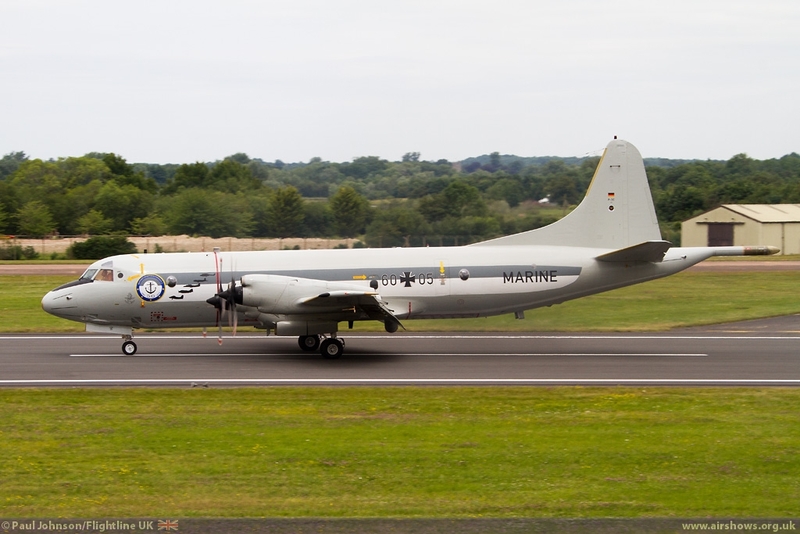 It was all very frustrating as preparing for the trip involved an immense amount of work on the part of the United States Marine Corps, the UK MoD and particularly the staff at RIAT. 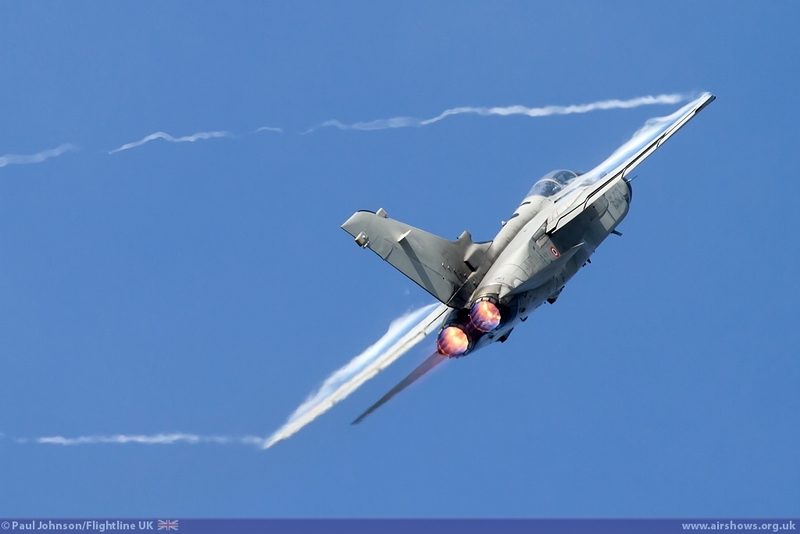 It must have been particularly frustrating for the display pilot, Flt Lt Hugh Nichols who had worked up a display routine and gone through the same "Public Display Authorisation" as all UK military display pilots have to go through. We hope it is not too long (2015 please!) 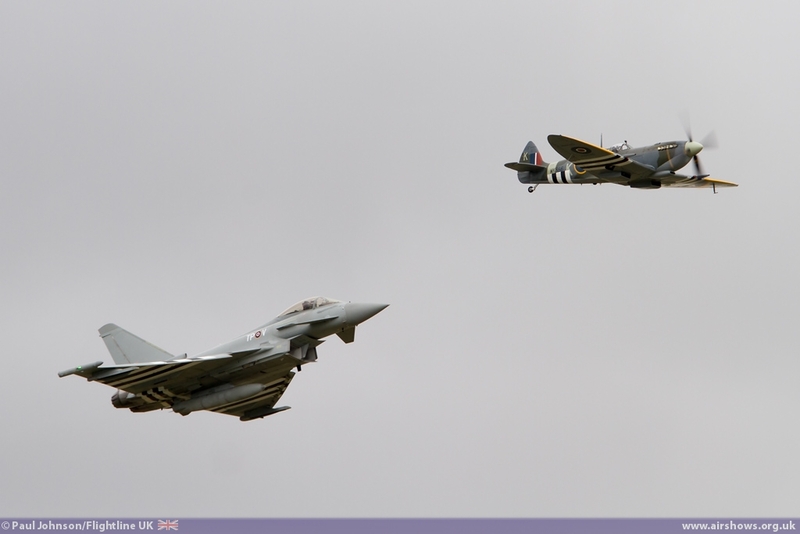 before we do finally get to see the new RAF and Royal Navy fighter in UK skies! 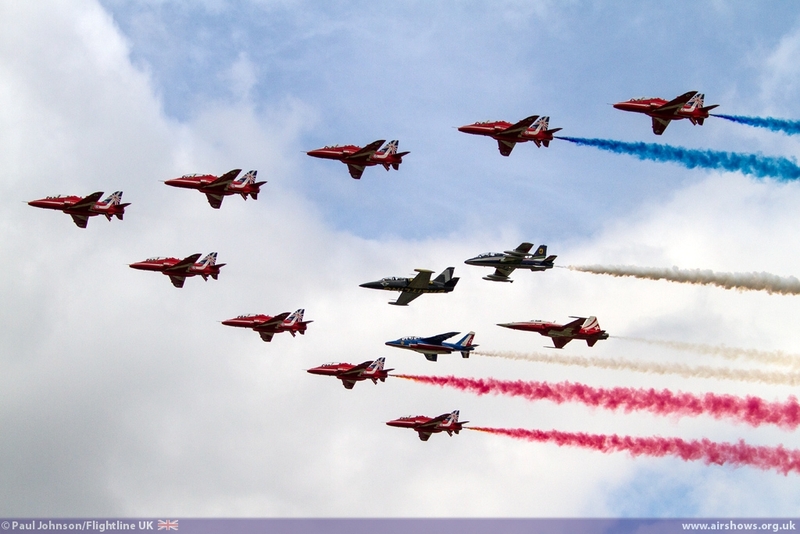 With the lack of F-35, the attention switched to the Red Arrows celebrations. 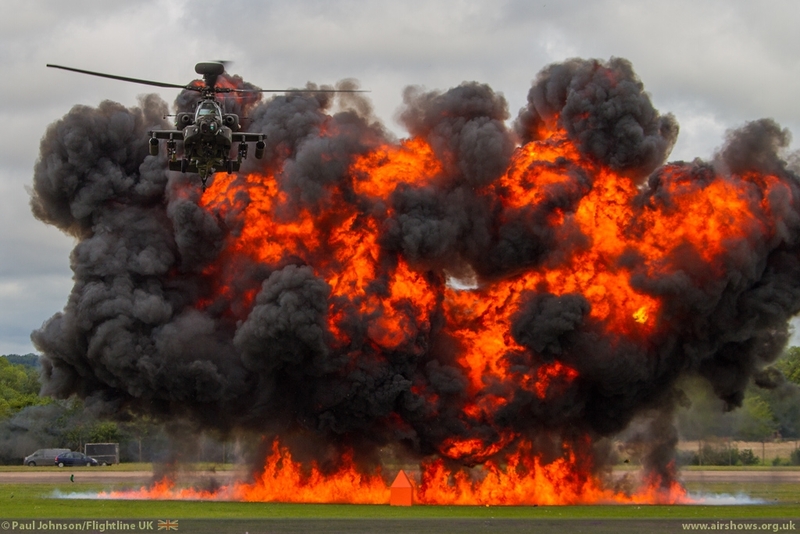 The main focus of these took place on the Friday "Pit Day" which saw RAF Fairford open its gates to a limited crowd of around 10,000. 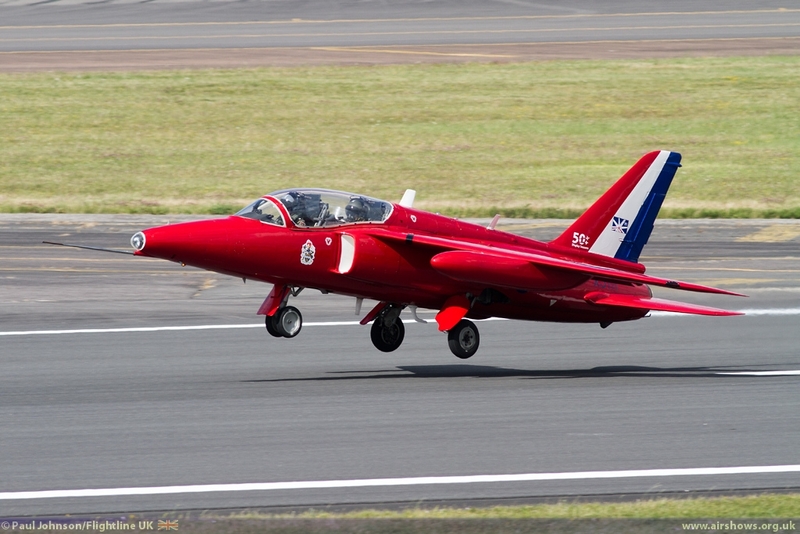 Special access was arranged to the display teams parking area at the Eastern end and the Red Arrows pilots were made available at various times for autograph signings. 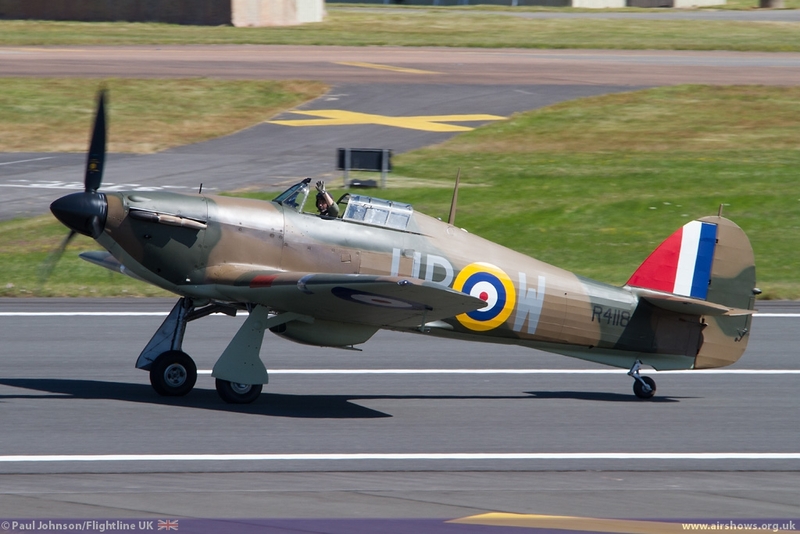 The Pit Day access to the aircraft was also OK, but nothing really special and no different to that offered at other venues such as Biggin Hill, particularly with the other teams seemingly not taking part! 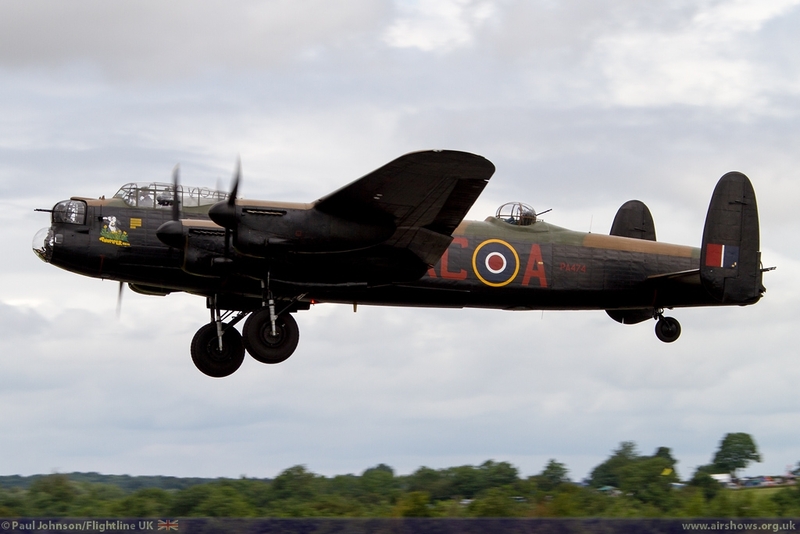 The afternoon saw a smaller four hour flying display featuring various aircraft. 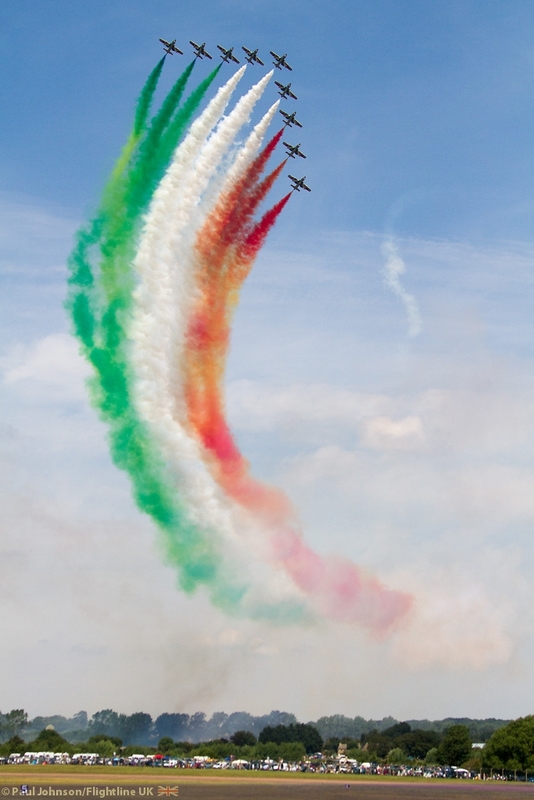 The overall highlight was the joint flypast by all nine Red Arrows with the leaders of the Breitling Jet Team, Patrouille de France, Il Frecce Tricolori and Patrouille Suisse. 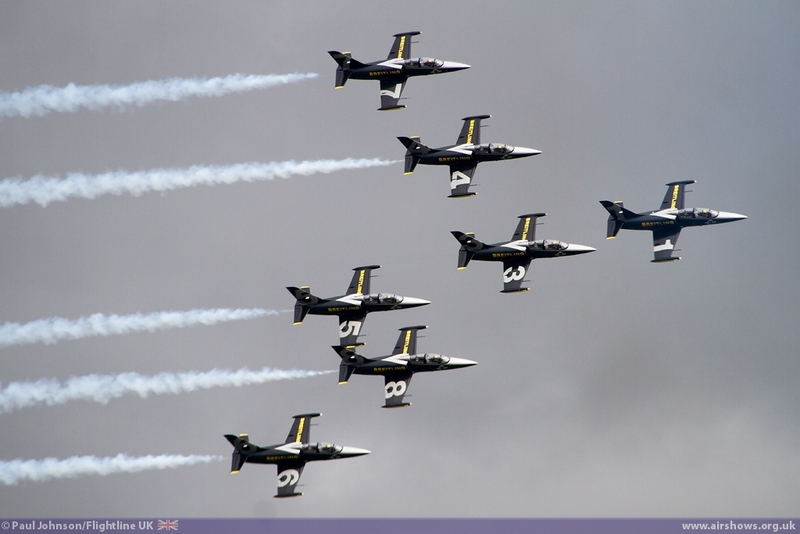 It was a particularly difficult formation to get right with the leaders aircraft all having very different performances. 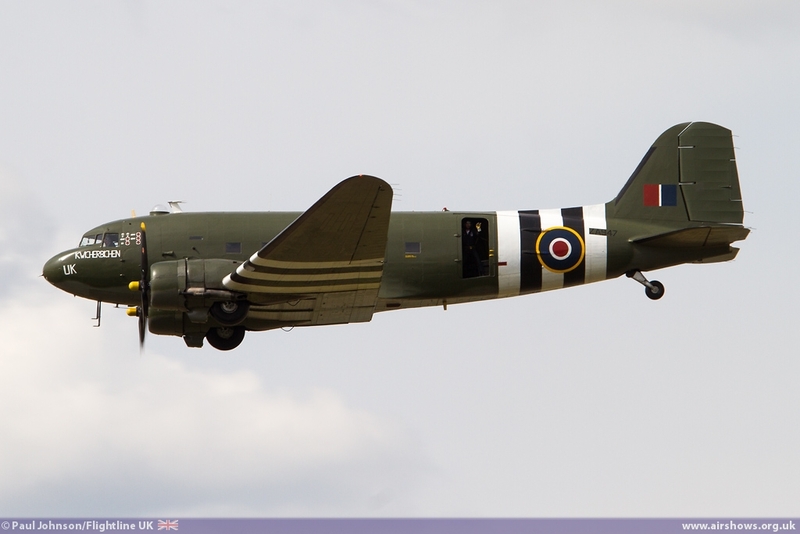 The rest of the flying display for various reasons came a bit disjointed however and never really built up a good flow with the need to fit in various arrivals and some unservicability. 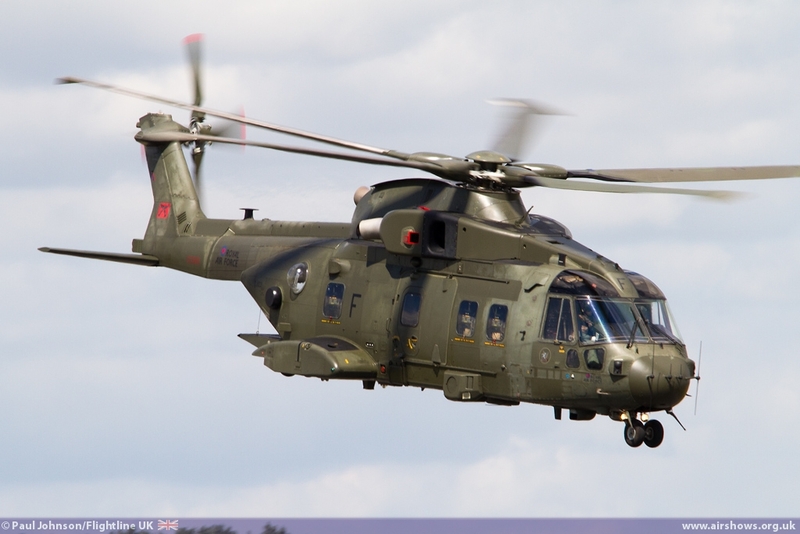 Much of the static was also closed on Friday as aircraft arrived and were shifted into position. However once fully opened, it did seem much more sparse than usual. 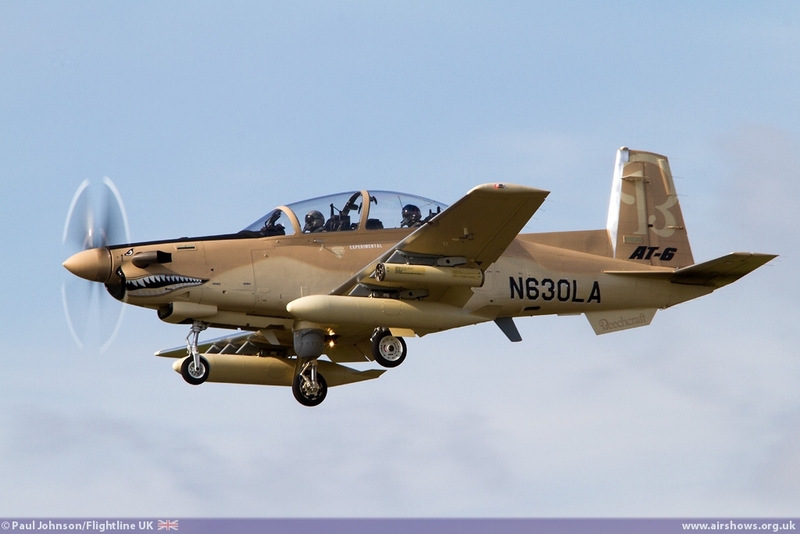 The actual aircraft numbers were about normal for the most recent editions of RIAT, but nowhere near the truly massive years in the 1990s. 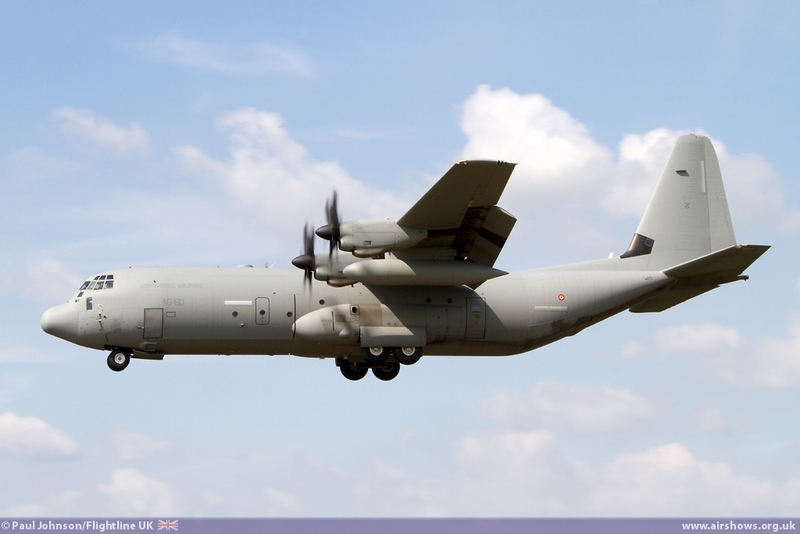 For the first time there was a notable lack of heavy aircraft such as the big transports like C-17, C-5 and so on. 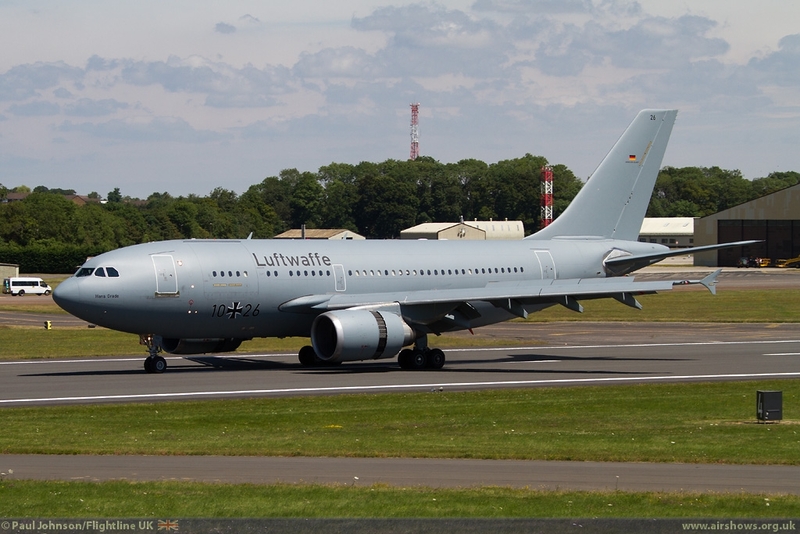 Further adding to the lack of heavies was the recall to Germany of a Luftwaffe Airbus A310MRTT during Friday for an urgent sortie. 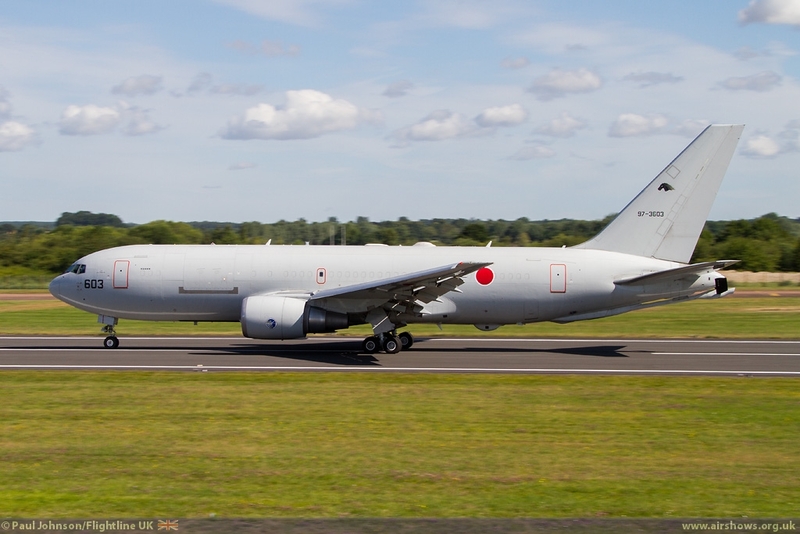 The star of the static was one of the few heavy aircraft, the Japanese ASDF Boeing KC-767J multi-role tanker transport. 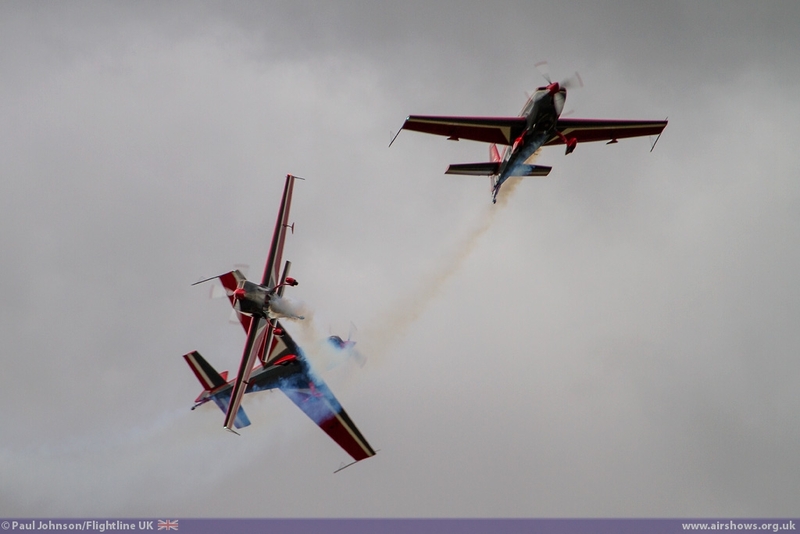 The JASDF and the aircraft were making only their second only visit to RIAT. 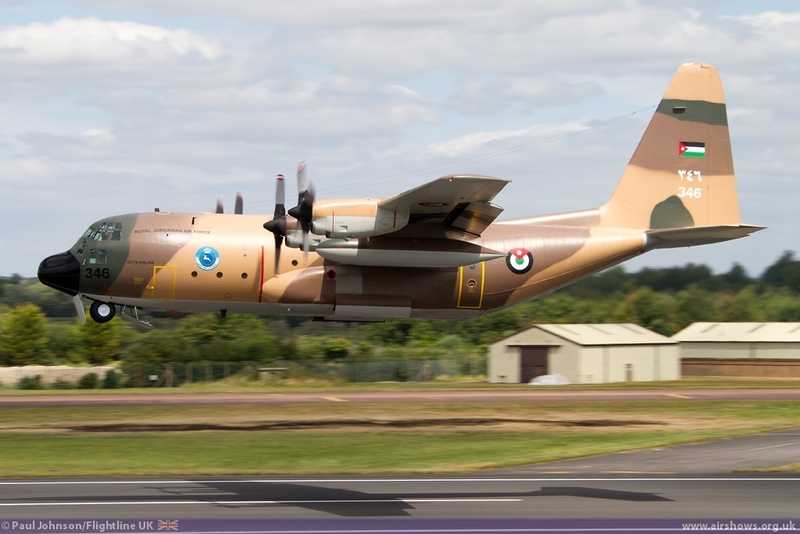 Bringing in these incredibly rare visitors is really what the Air Tattoo does really well and it was great to see them back with a very well presented aircraft. 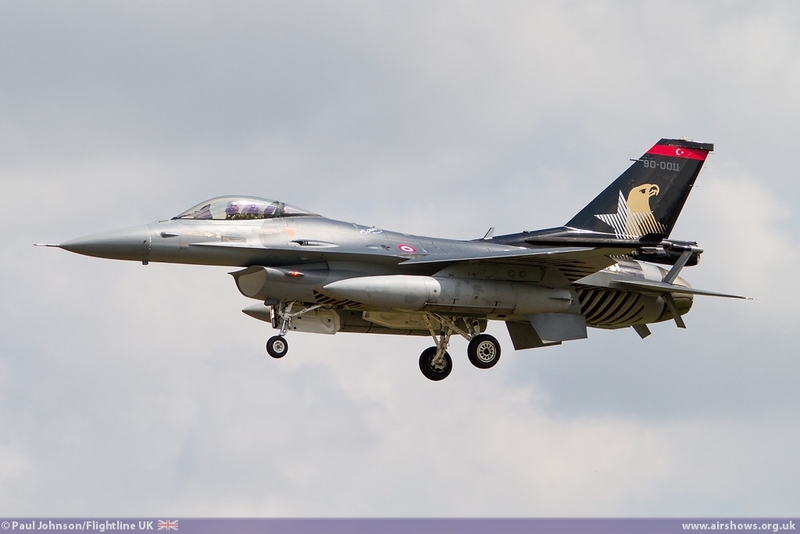 Amongst the smaller themes of the Royal International Air Tattoo was the 40th Anniversary of the F-16 Fighting Falcon and the BAE Systems Hawk. 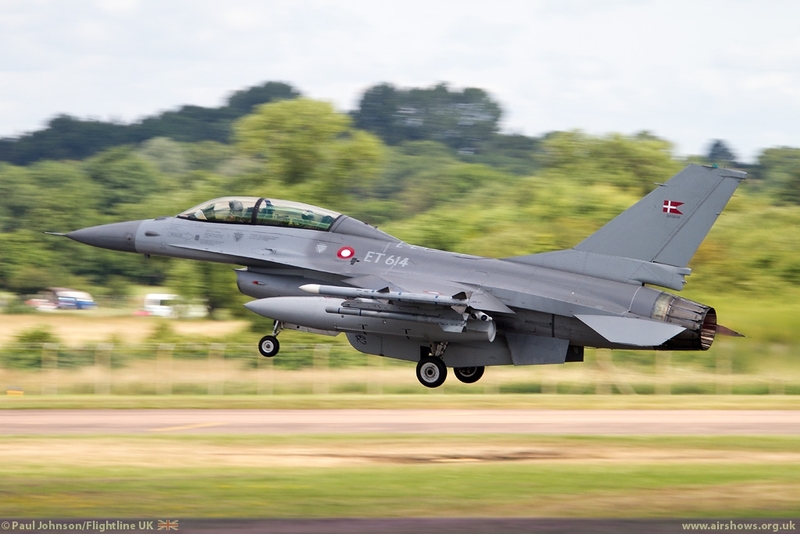 For recent times, the gathering of F-16s was impressive with a single example from the Belgian Air Force joined by pairs from Denmark, Norway and the Netherlands. 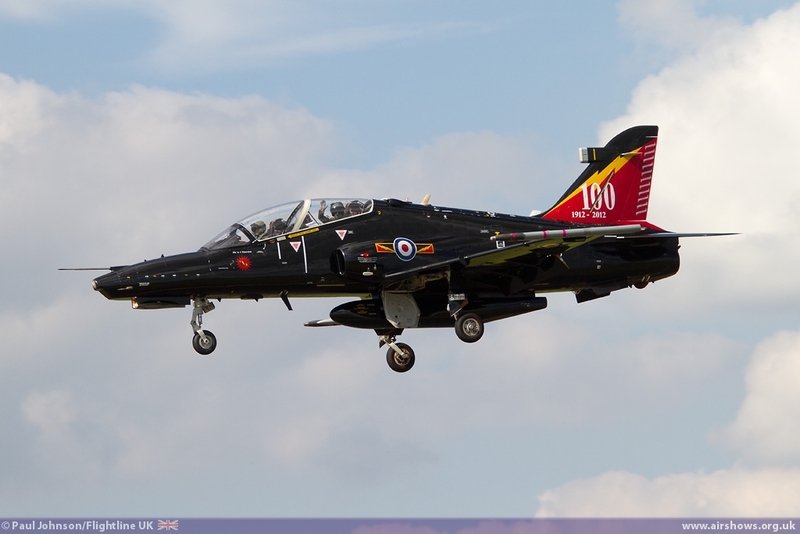 The Hawk anniversary surprisingly was less impressive though it was very good to see the first ever Hawk, XX154 in attendance wearing its striking new Empire Test Pilots School livery. 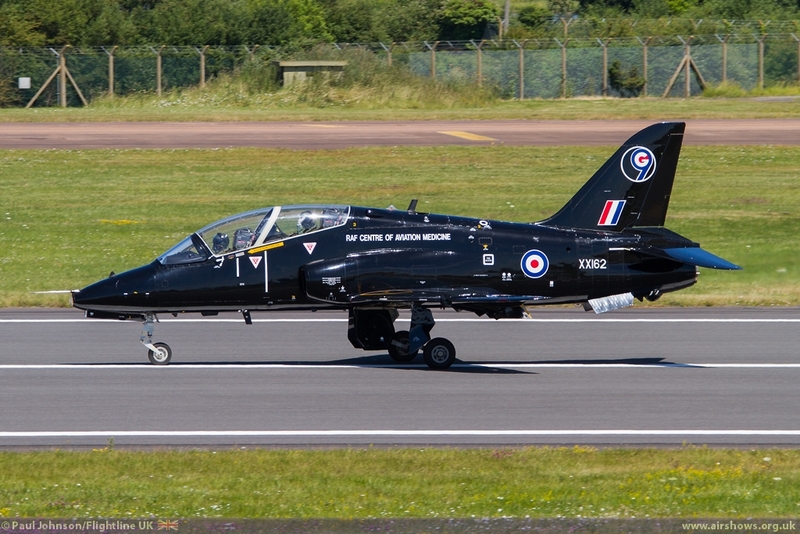 Another rare RAF Hawk was the RAF Centre of Aviation Medicine's example also from Boscombe Down. 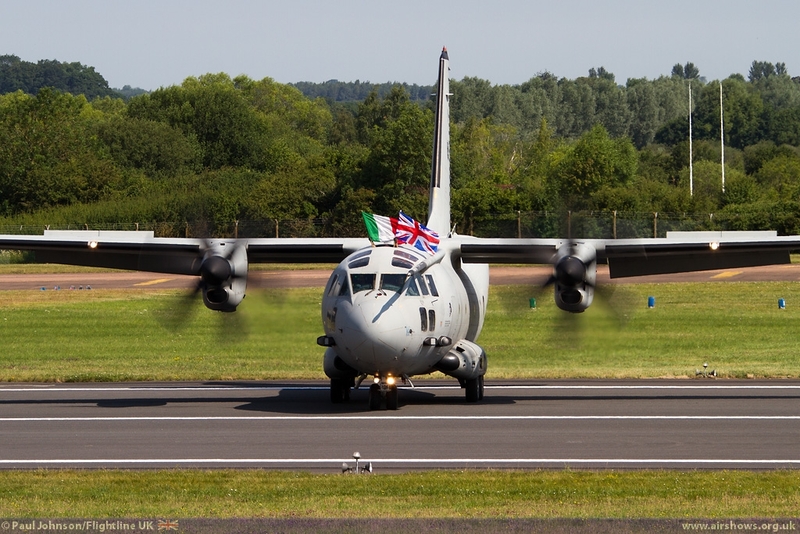 Though officially it was not a theme of RIAT, 2014 does see the 60th Anniversary of the C-130 Hercules and there were a number at the Tattoo both providing support and on static display. 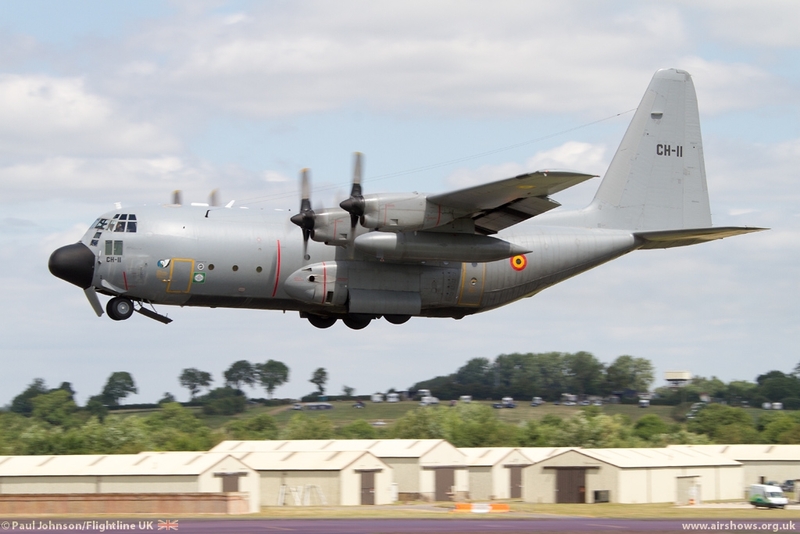 The arrivals and departure days saw visits by Swedish, Turkish and Italian C-130s bring in support equipment and crews for the various display teams. 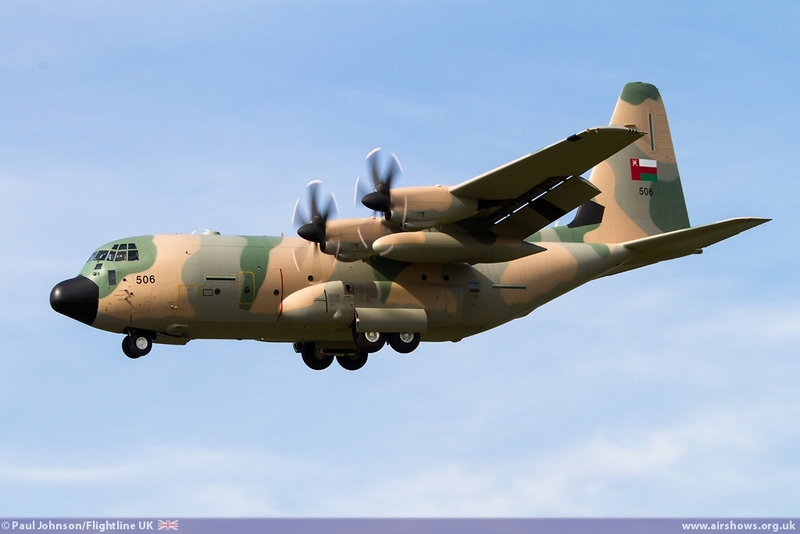 On the ground the legacy C-130H Hercules was represented by aircraft from Belgium, Jordan and the Netherlands. 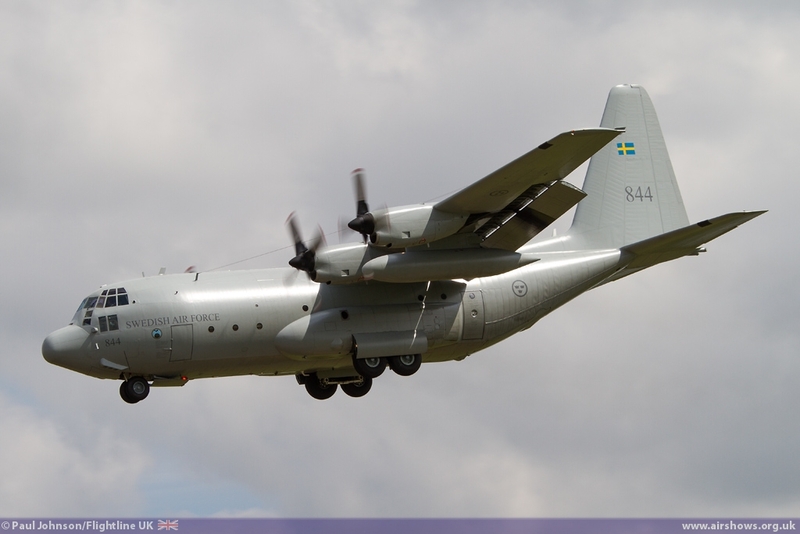 Newer C-130J Hercules IIs came from Norway and Oman. 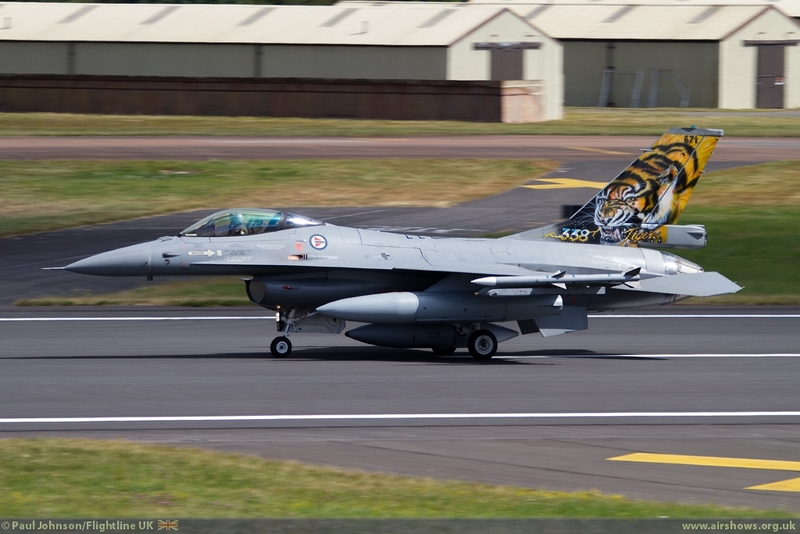 The latter looked particularly good in its factory fresh camouflage scheme! 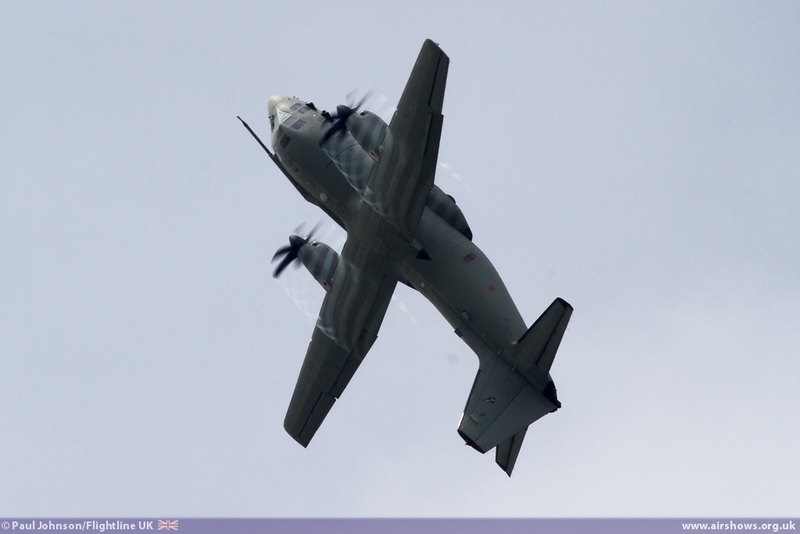 There were plenty of lighter multi-role transport aircraft on show. 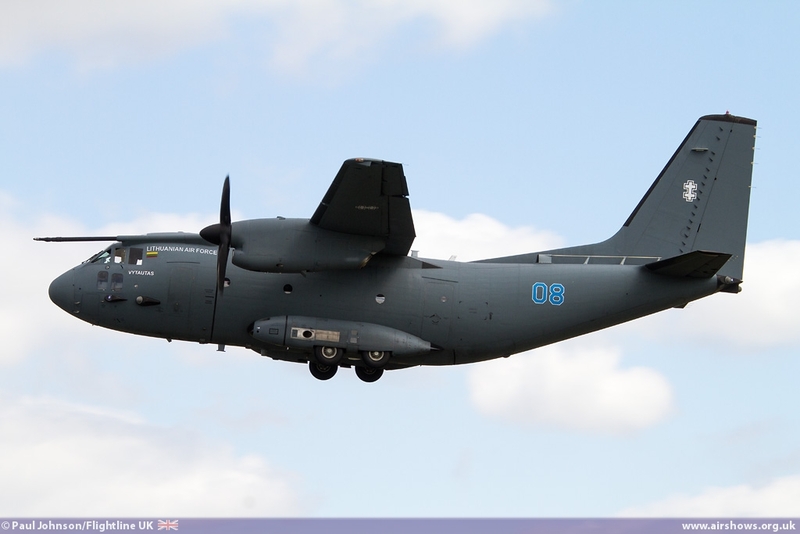 It is always good to see an Antonov, and the Hungarians obliged with a An-26 Curl transport. 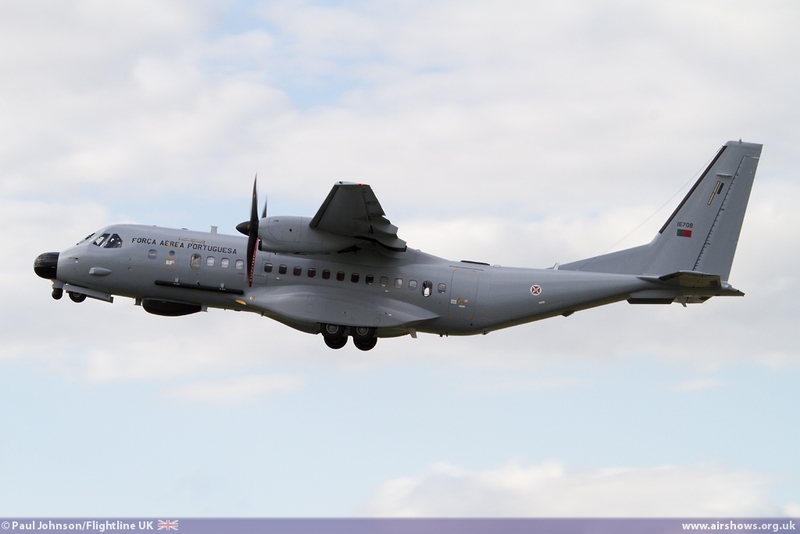 The Luftwaffe also sent a Transall C-160D for static while a French example supported the Patrouille de France. 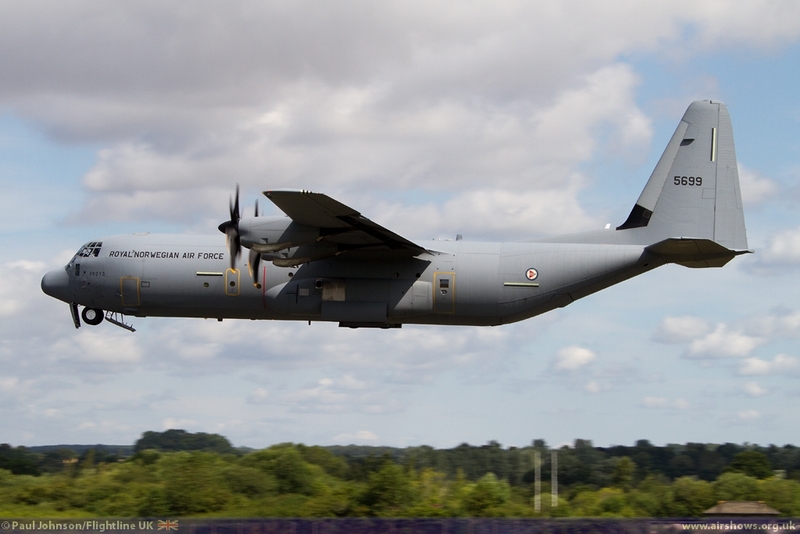 Both German and French Transall fleets are becoming smaller as the A400M starts to enter service with both air arms. 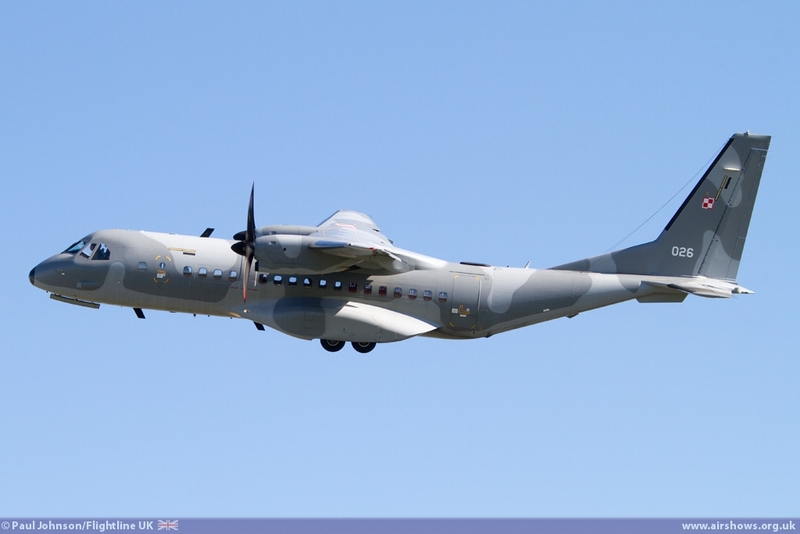 The Lithuanian Air Force also made a welcome return to RIAT with one of their very new and purposeful looking C-27J Spartans. 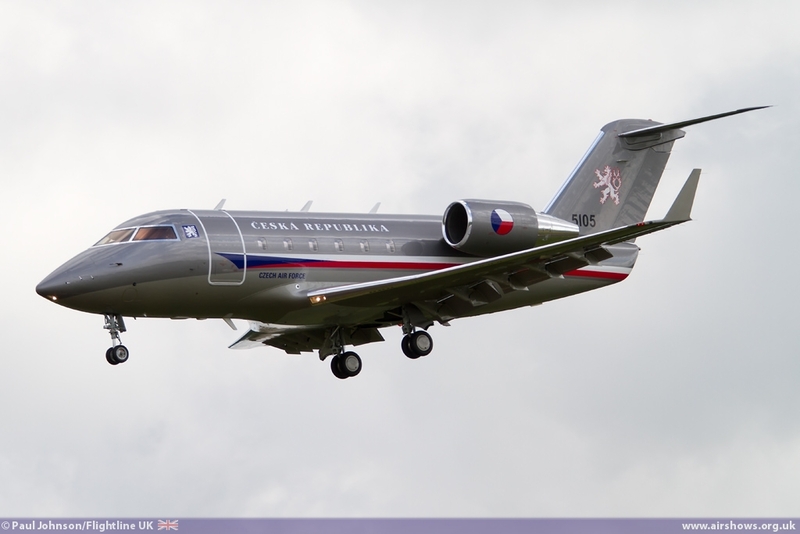 RIAT became something of a meet for Airbus Military CN295 aircraft. 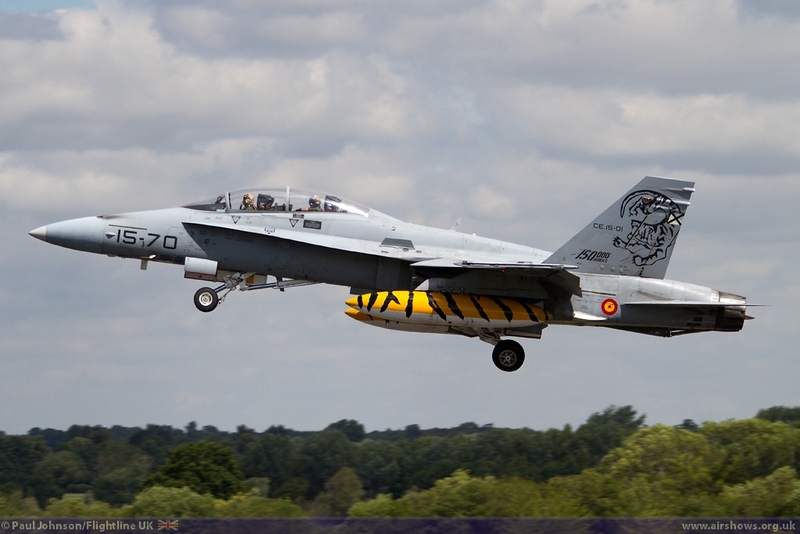 The Spanish and Polish Air Forces sent their standard transport examples for static display. 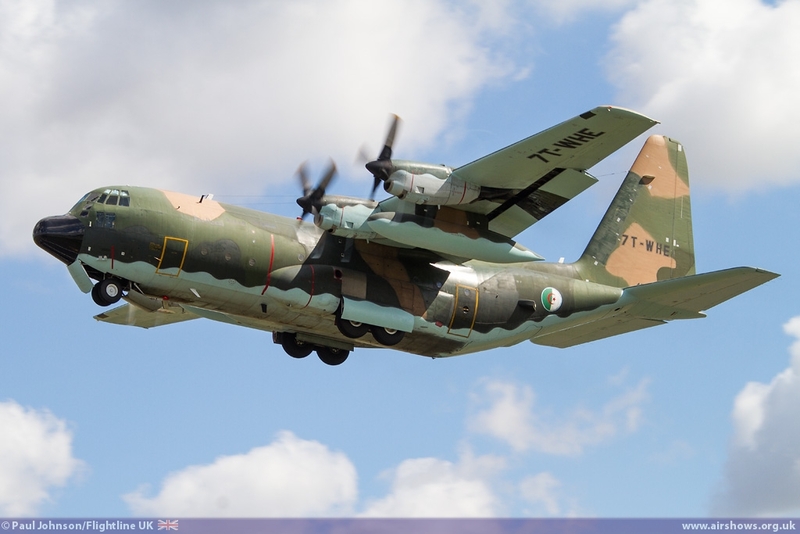 The Portuguese Air Force sent a Martime Patrol example which also looked factory fresh! 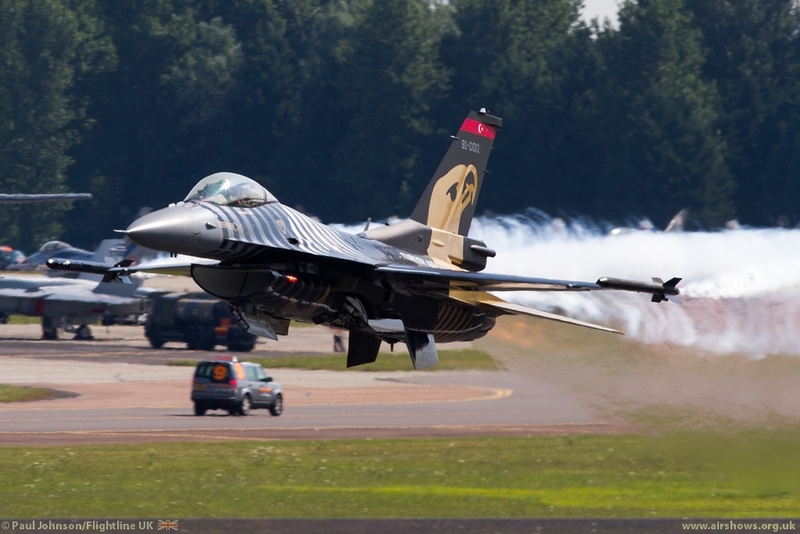 2014 was notable too for the return (officially) of the United States Air Force to the Air Tattoo line-up. 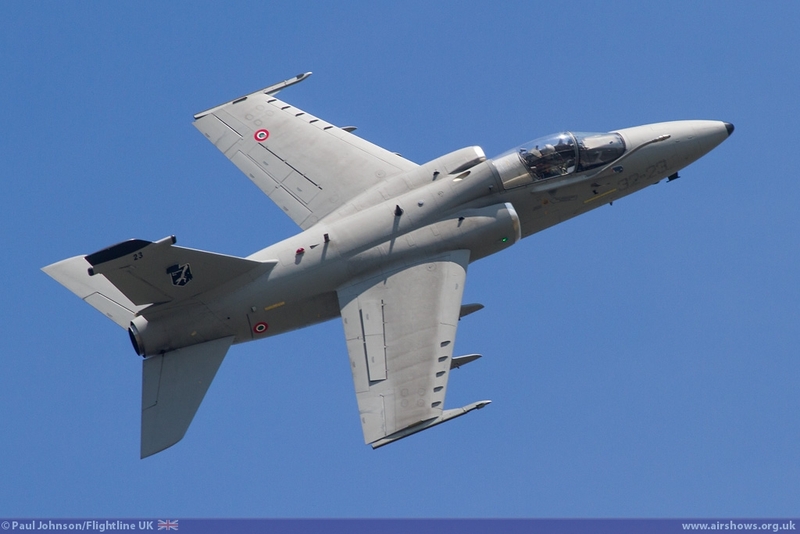 Their presence may have been very small this year, but it was significant considering no other UK airshow has so far attracted USAF participation since the start of sequestration (though Waddington came close.) 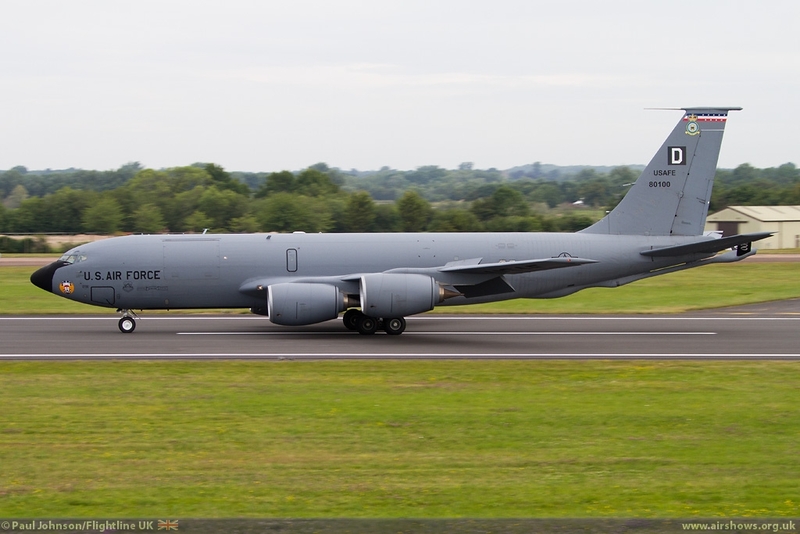 Both of the attending aircraft were UK based with a KC-135R Stratotanker from the 100ARW at RAF Mildenhall and a F-15E Strike Eagle from the 48th FW at RAF Lakenheath. 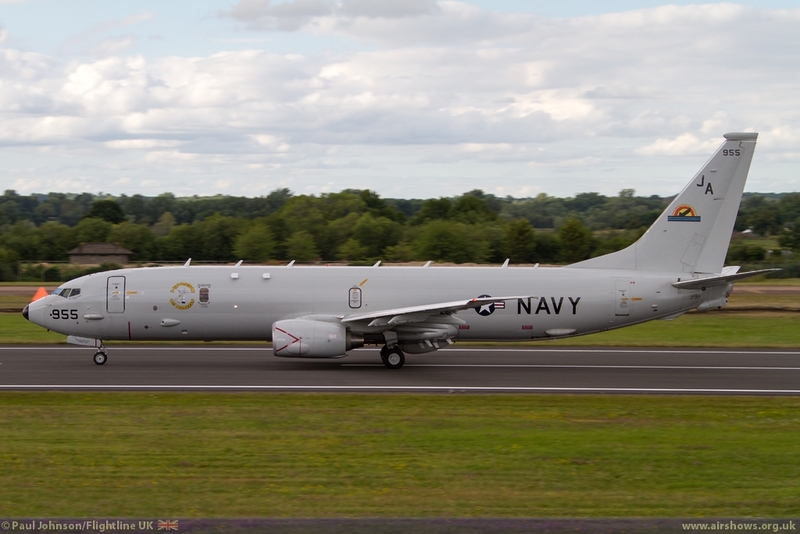 The US Navy were also involved with their Boeing P-8A Poseidon which was touring the UK's biggest airshows in July to promote the type to new customers. 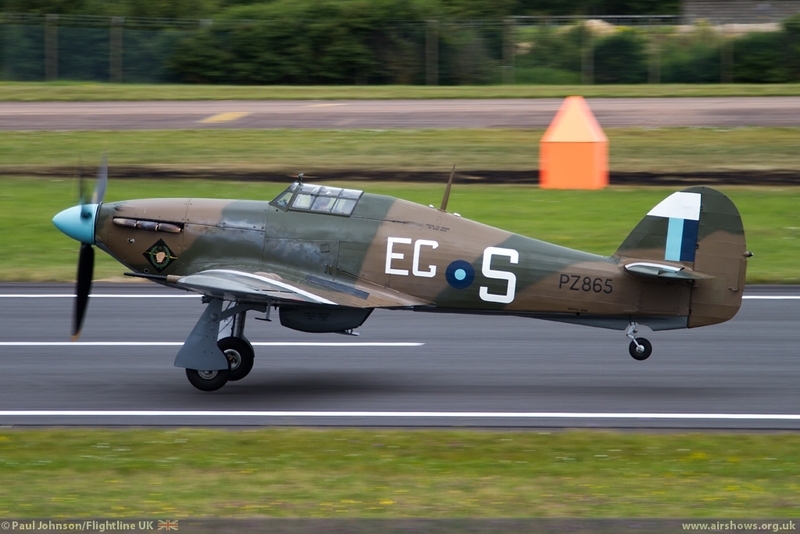 There were some great special schemes amongst the static display. 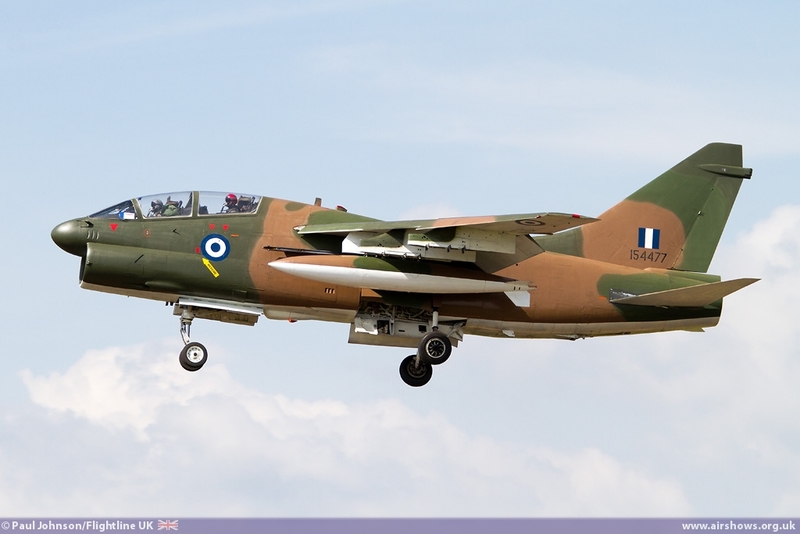 The Hellenic Air Force sent a pair of LTV A-7E and TA-7C Corsair IIs for their last ever appearance at an airshow outside of Greece before retirement. 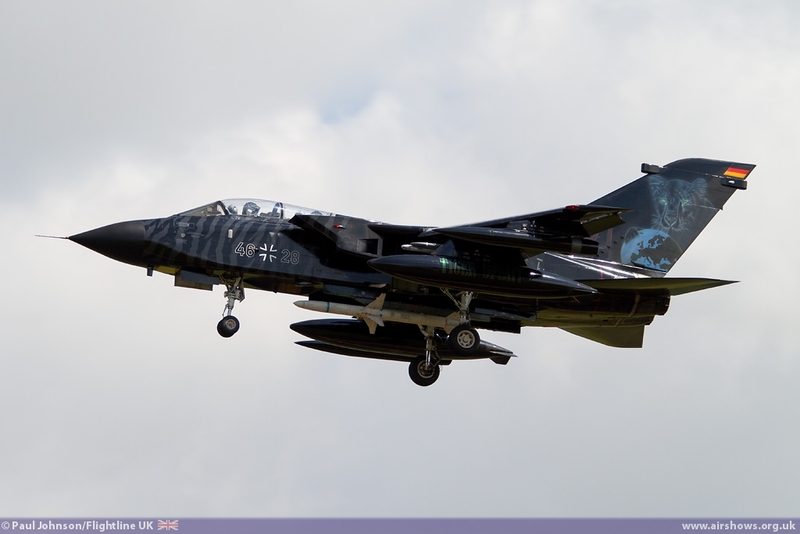 The single seat example wore a very striking black scheme celebrating 336 Olympos Squadron and duly won the award for best special livery presented by Jeppensen. 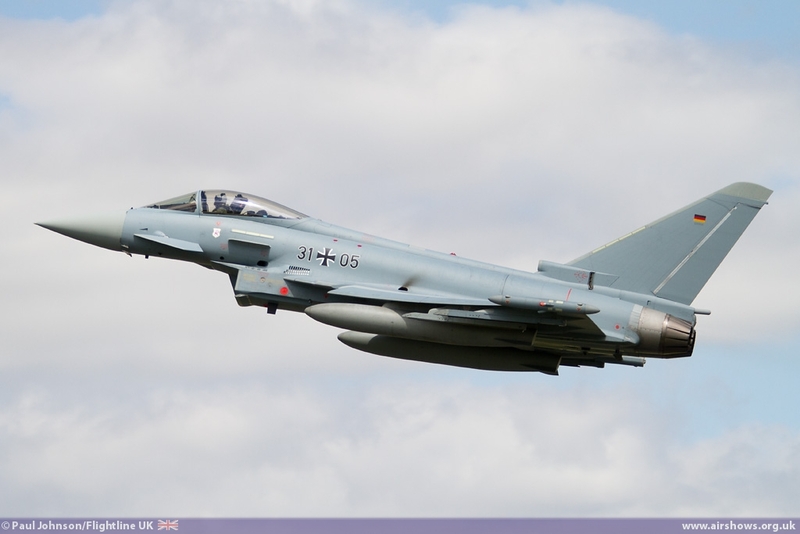 Major Apostolos Papadopoulos said: "We were very glad to be here, to support RIAT and the Charitable Trust. 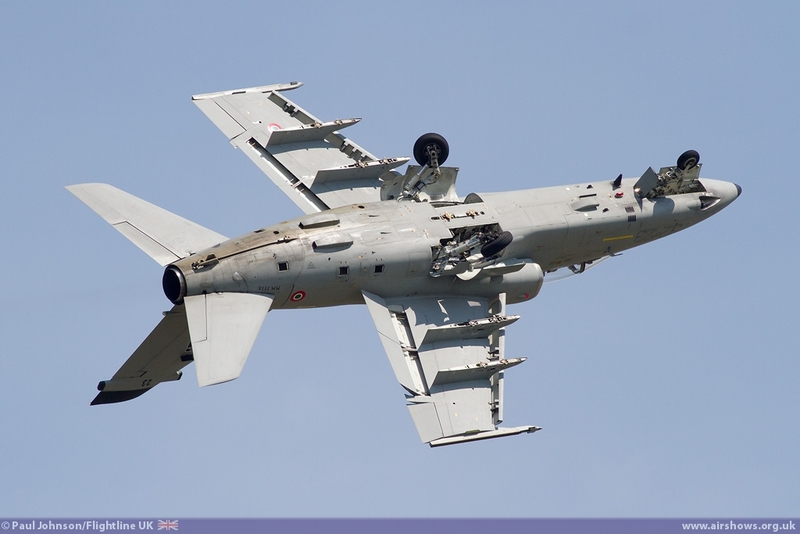 This is the last time the A-7 will be presented outside Greece and that makes this award very special." 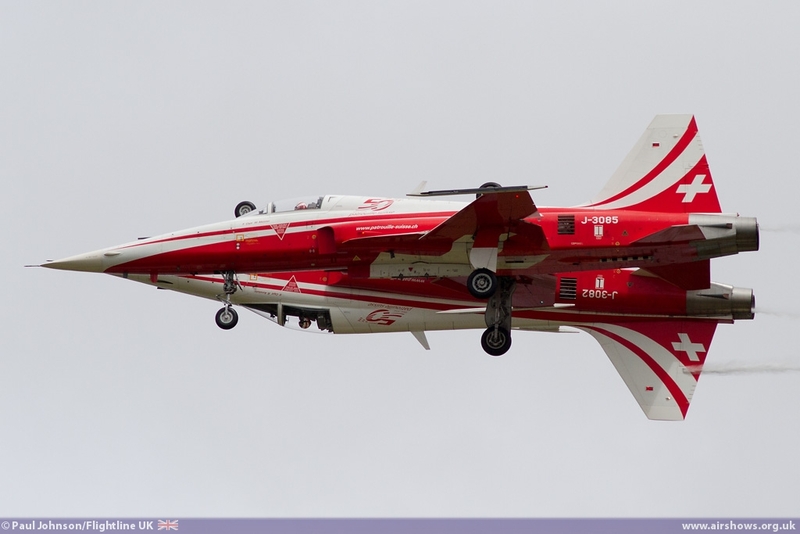 Elsewhere, the Luftwaffe sent a very colourful Panavia Tornado ECR and the Spanish Air Force made a welcome return to RIAT with a tiger marked EF-18B Hornet. 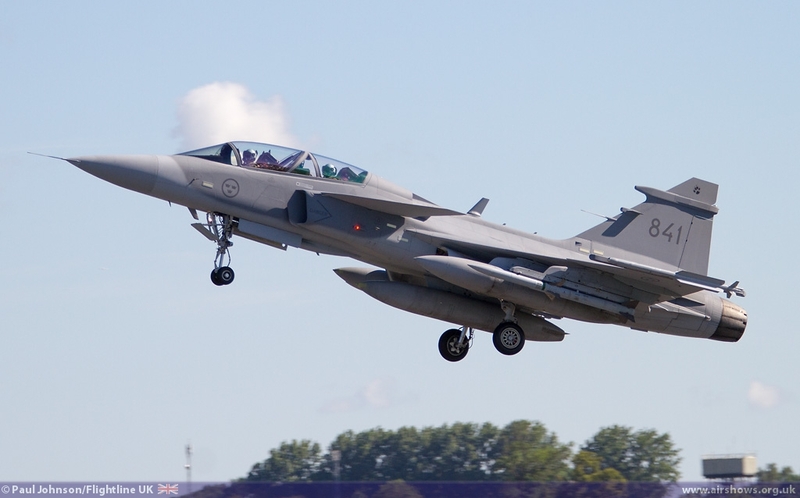 Other fast jets on static included Hungarian and Swedish JAS-39D Gripens, RAF and Luftwaffe Typhoons and a single RAF Panavia Tornado GR4. 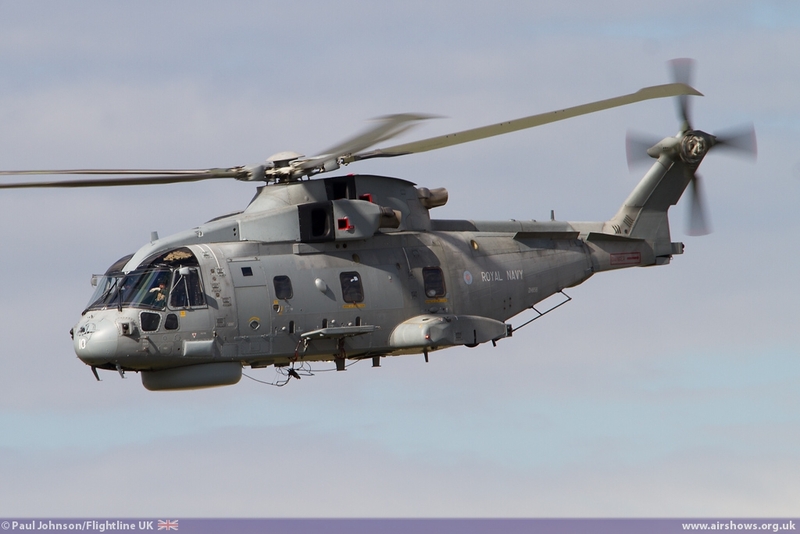 QinetiQ did put in a good showing too with the AgustaWestland AW109, Alpha Jet A and the BAE Systems Avro RJ100. 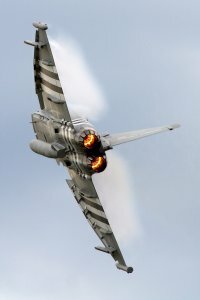 The flying display however was just as big as ever starting before 10am each day over the weekend and finishing around 6pm. 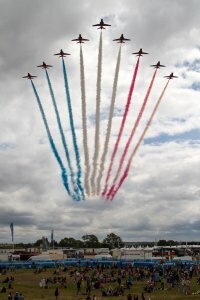 With the loss of the F-35 from the flying programme, it did mean the Red Arrows lacked any special flypasts over the main two days which was particularly disappointing considering the main theme of the show. 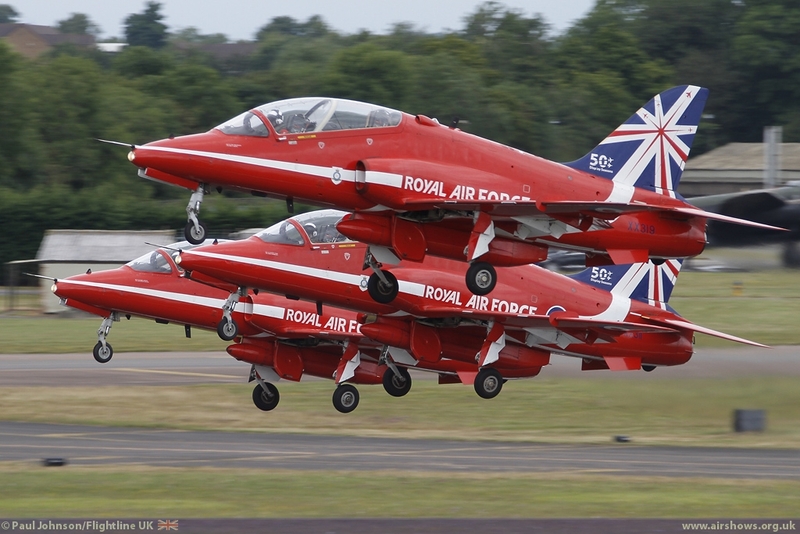 However, that did not mean the Reds were not the stars of the show for many and it certainly looked like standing room only across the showground as they displayed. 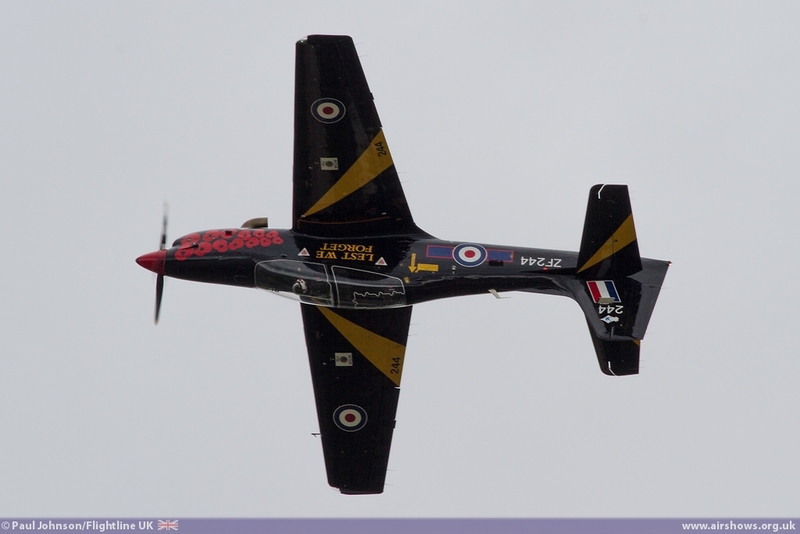 The team also picked the Steedman Display Sword presented for the best UK Flying Display. 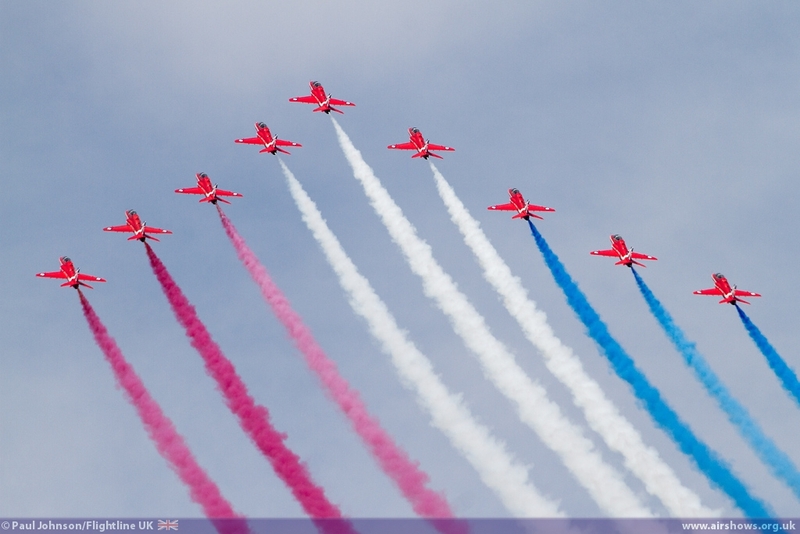 Air Marshal Sir Kevin Leeson presented the sword to Sqn Ldr Jim Turner, who said: "Celebrating the 50th anniversary of the Red Arrows has been memorable, and I hope the Red Arrows will still be displaying after another 50 years." 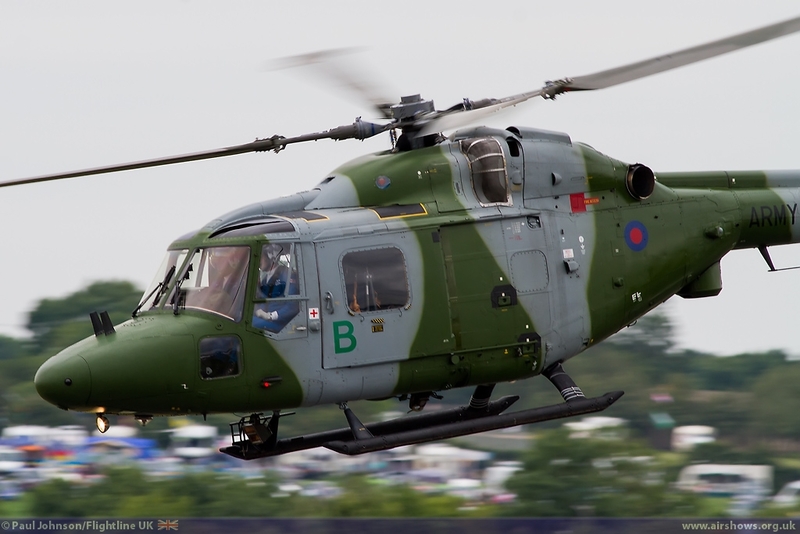 Royal Air Force support for the flying display was also a little lacking with nothing above the usual solo display teams and the Battle of Britain Memorial Flight. The BBMF did display all their types however, with the Spitfire LF IX, Hurricane IIc and Lancaster presenting the standard three-ship routine and the Douglas Dakota III appearing as a solo display The solo displays saw the Tucano flown by Flt Lt Dave Kirby and the Typhoon FGR4 flown by Flt Lt Noel Rees. 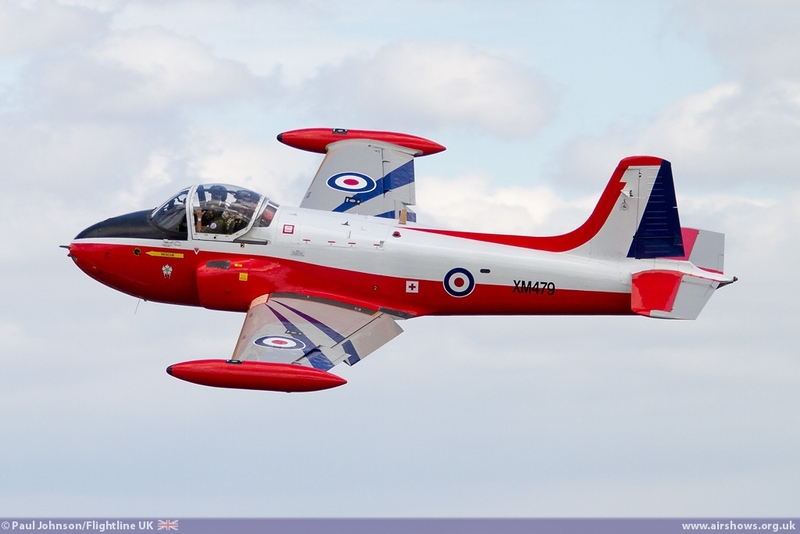 Noel was another award winner picking up the Paul Bowen Trophy - presented in memory of the Royal International Air Tattoo co-founder Paul Bowen for the Best Solo Jet Demonstration. 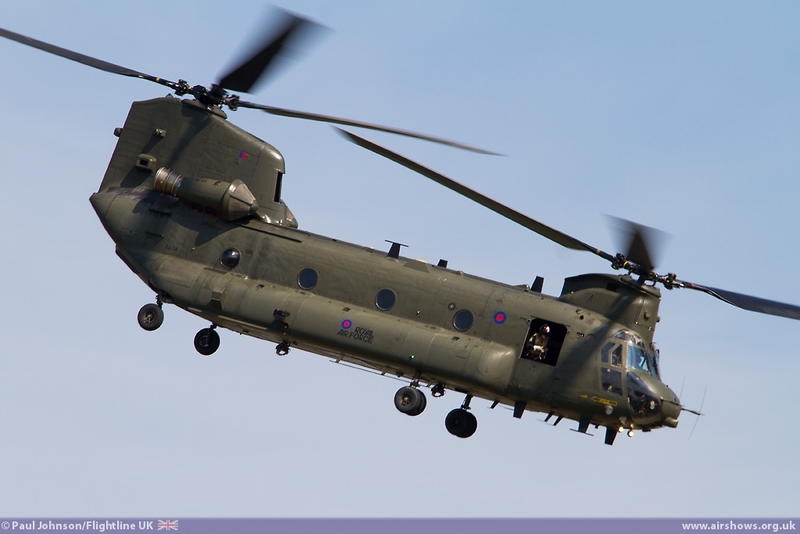 Flt Lt Rees said: "It's an absolute honour to receive this on behalf of the whole team. 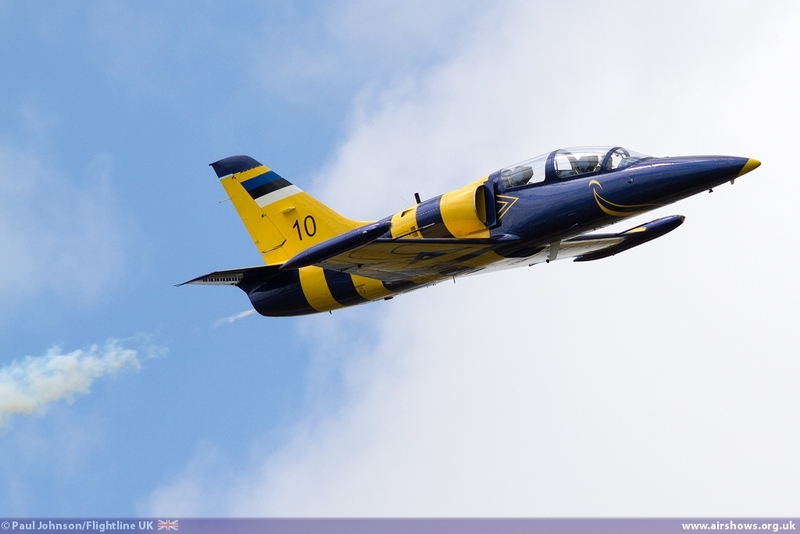 They are the ones who got the jets ready this weekend and we displayed in sometimes challenging weather. It's a fitting award for the whole team." 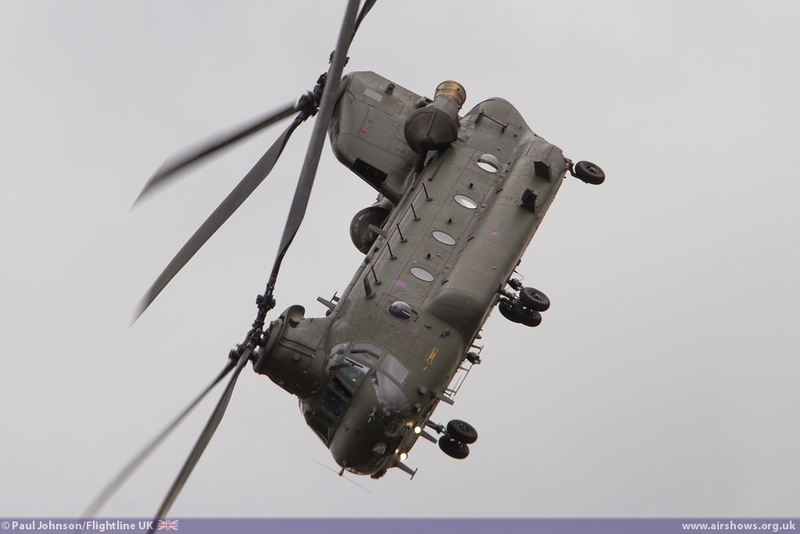 Rotary action came from the RAF's Chinook HC2 which gave another superb account of itself with its dramatic display of tight turns, steep climbs and "rotor-slap!" 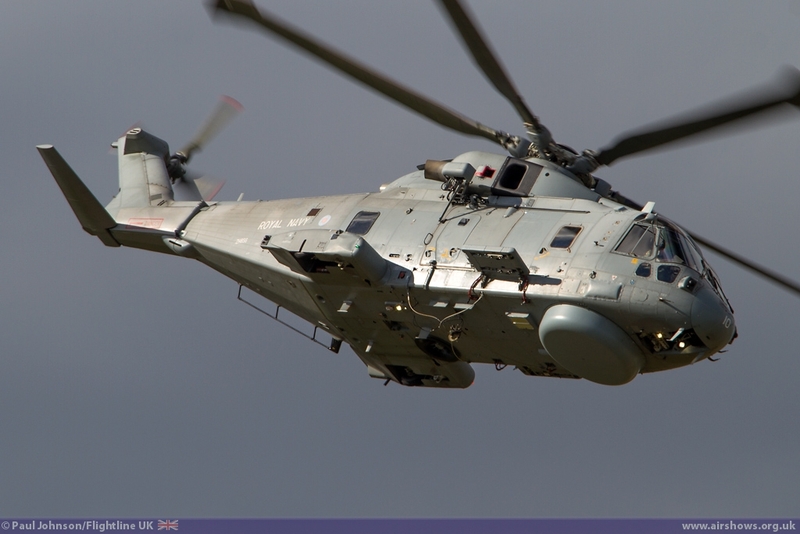 The sole Royal Navy display at the Air Tattoo, the Westland Merlin HM2, had a bit of a nightmare going unserviceable on the Friday and Saturday but eventually did make its display on the final day. 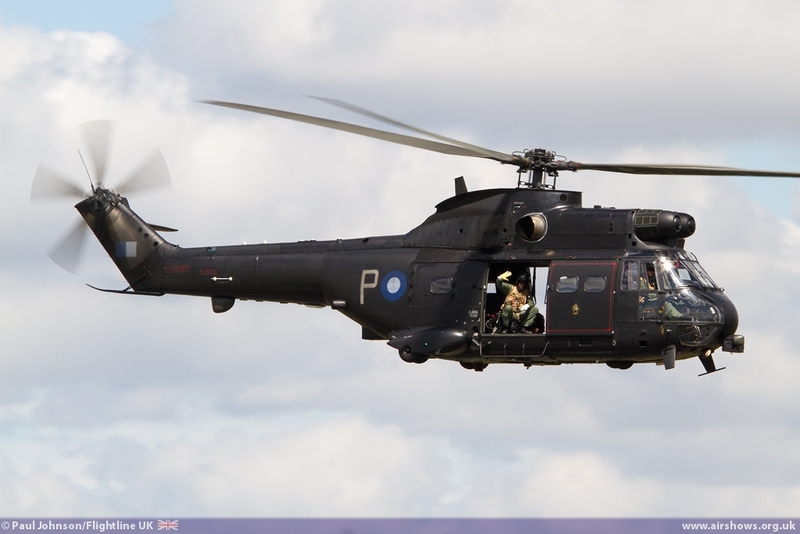 The British Army by contrast had a much more successful weekend. 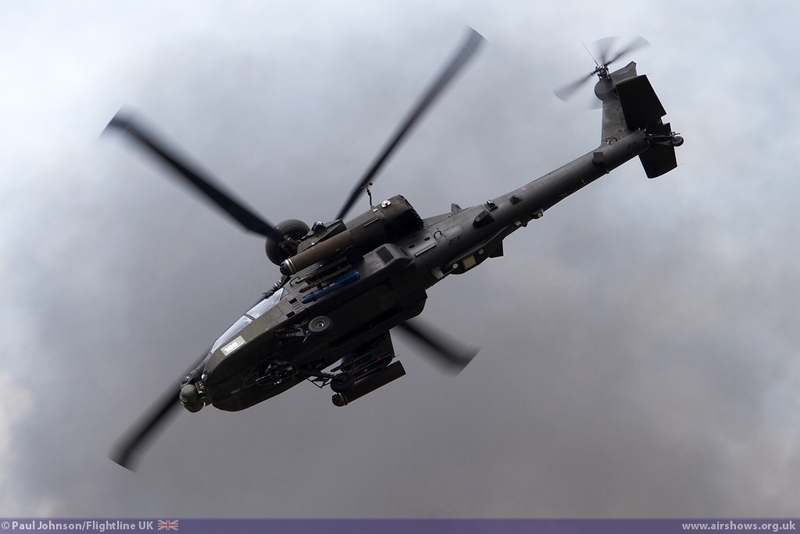 The Apache AH1 certainly grabbed everyone's attention with its display supported by Pyrotechnics from those mad people at Event Horizon - even the Hares were running scared! 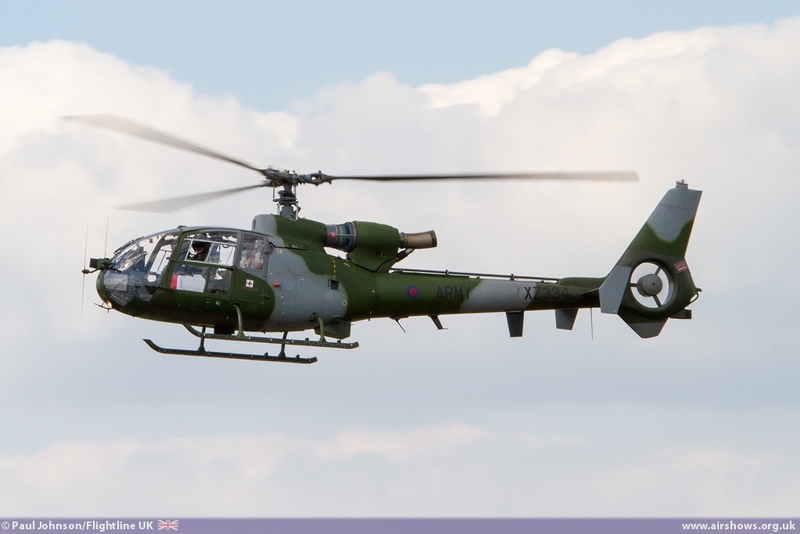 However special mention was go to the Lynx AH7 making its last appearance in an Air Tattoo flying display with its unique aerobatic sequence. The pilots, WO1 Mick Kildea and Capt Neill Posthumus rightfully won the King Hussein Memorial Sword for Best Overall Flying Display. 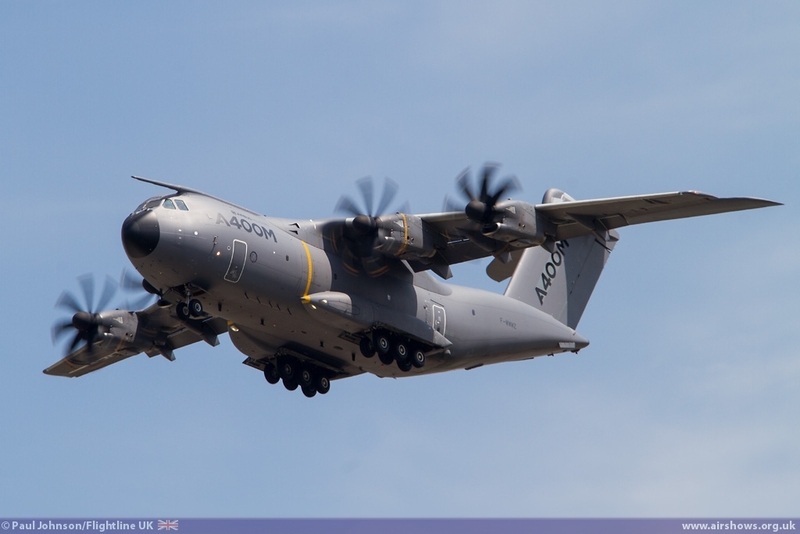 With RAF Brize Norton just a few miles away, Fairford is the ideal venue for Airbus Military to show off the future of RAF Tactical and Strategic Transport with the A400M Atlas. 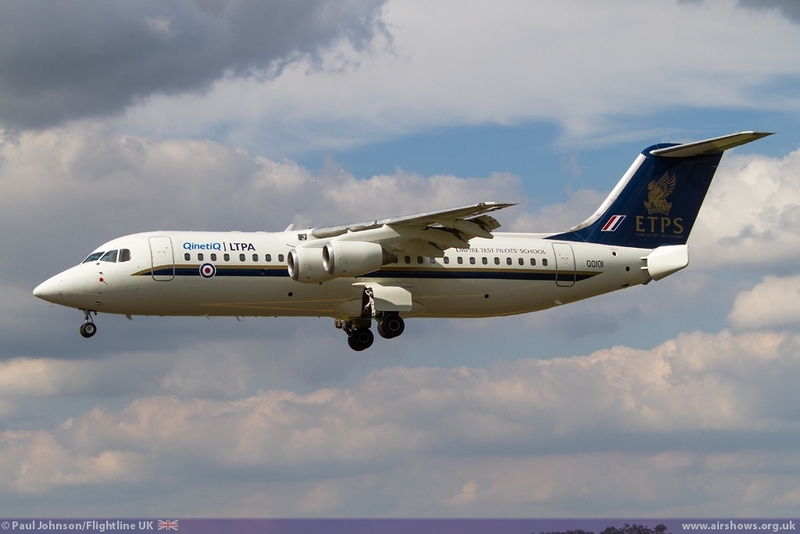 Pilot Ed Strongman put the new airlifter through a stunning sequence starting with a very steep turning climb off the runway and including the trademark 120 degree wingover. 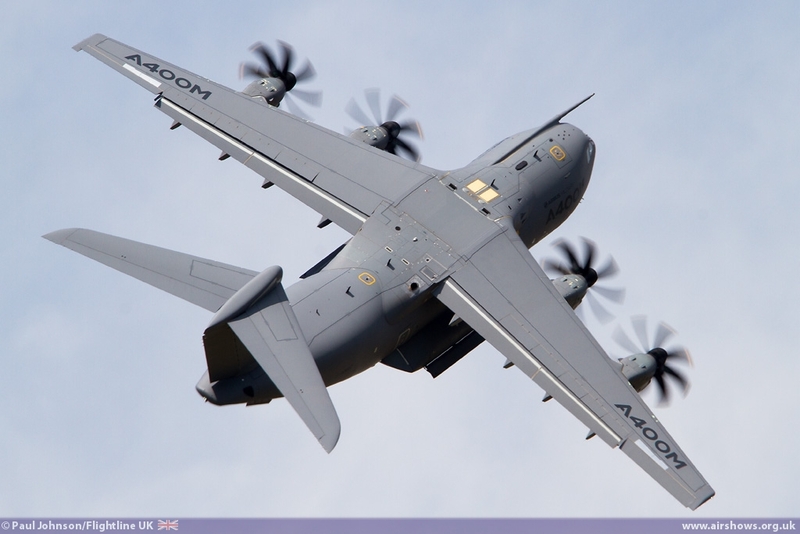 Friday also saw all the various Air Force chiefs treated to a flight into RAF Fairford aboard the A400M. 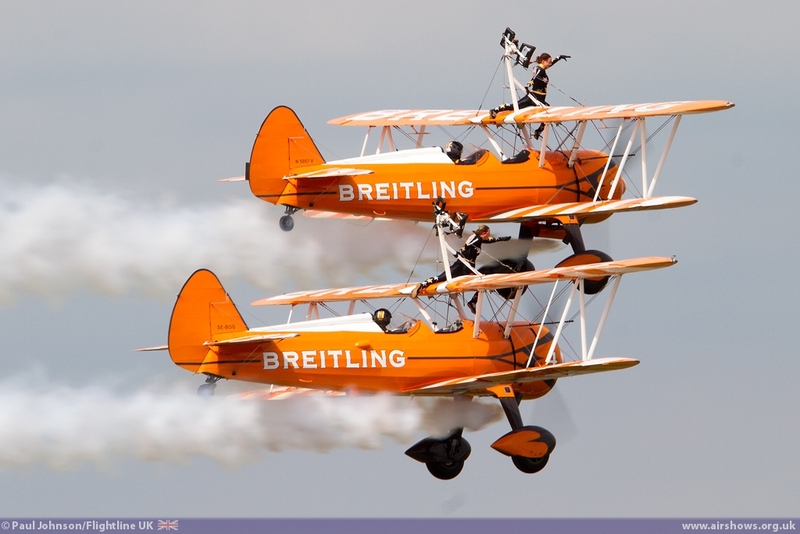 The other "Home" team act were the Breitling Wingwalkers. The team, based just a few miles north of Fairford at RFC Rendcomb, were part of the impressive support from the Swiss Chronograph Company. 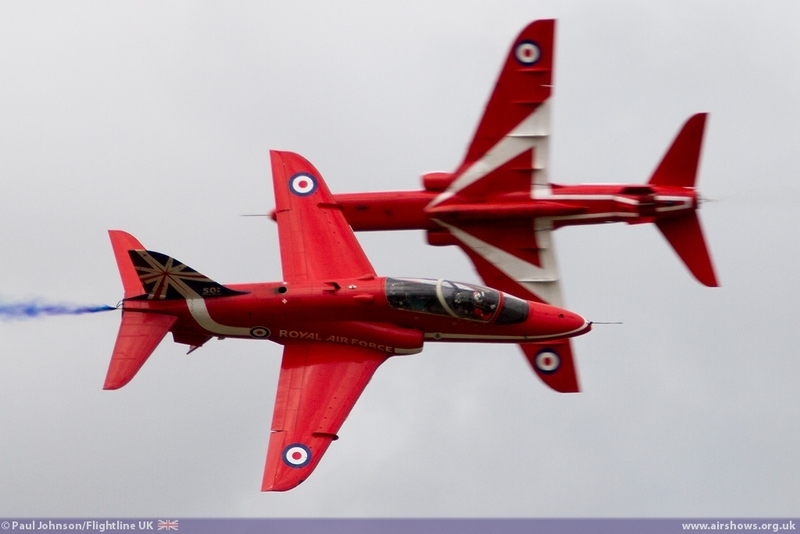 For RIAT, the team had the full four-ship routine and also marked the first public display by Emily Guilding who has joined her sister Stella as part of the team. 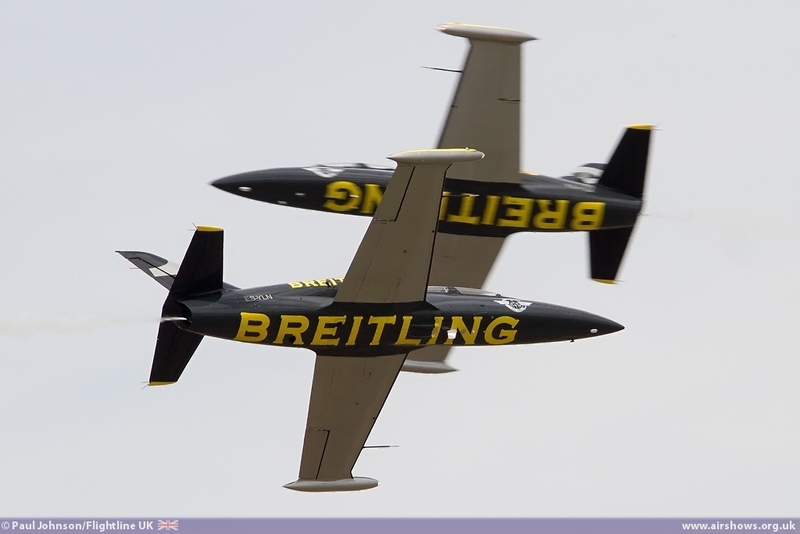 Completing the Breitling package were the Breitling Jet Team led by Jacques Bothelin. 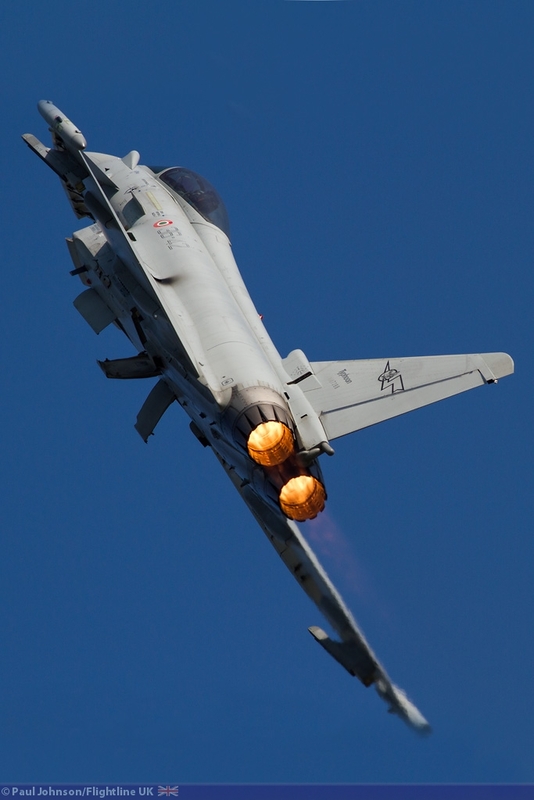 Since the team last appeared at the Air Tattoo two years ago the team have been on tour to the Far East displaying in China, Indonesia, the Philippines, Japan and Malaysia. Next year sees the team head west for an equally ambitious tour of the United States and Canada. 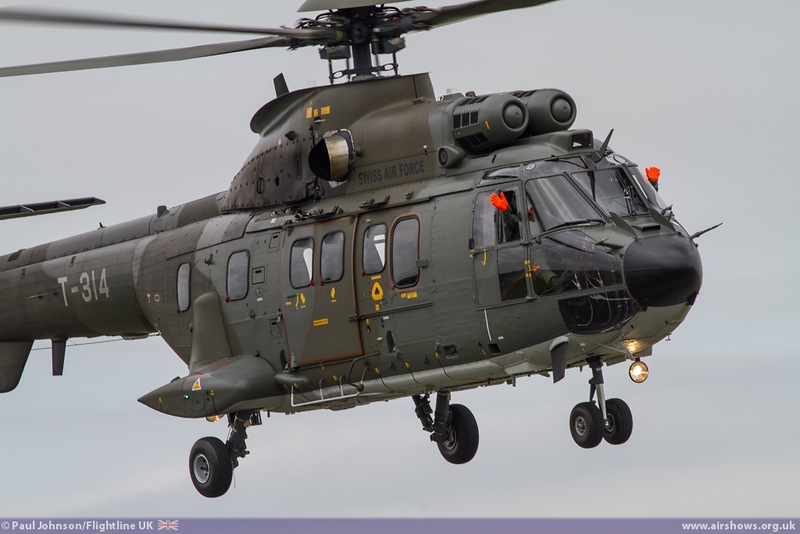 While the RAF participation may have been lacking, three European Air Forces put in exceptional levels of support for the RIAT flying display. 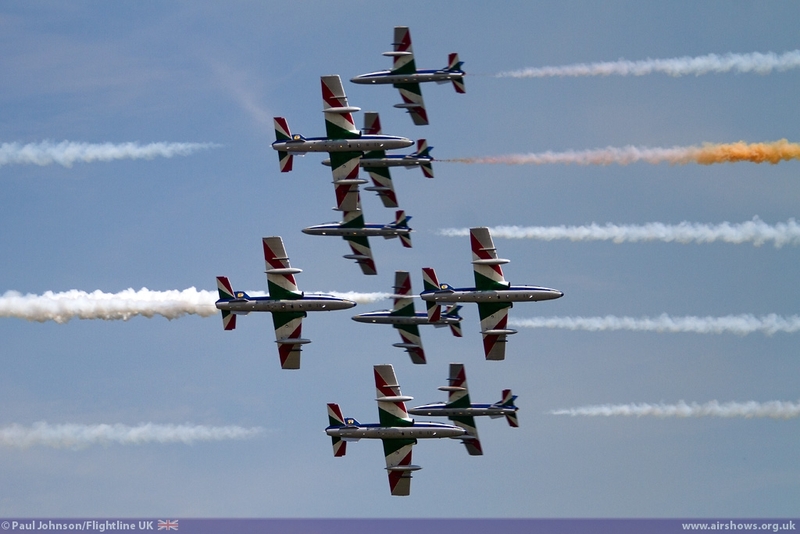 The Italian Air Force support was nothing short of magnificent. 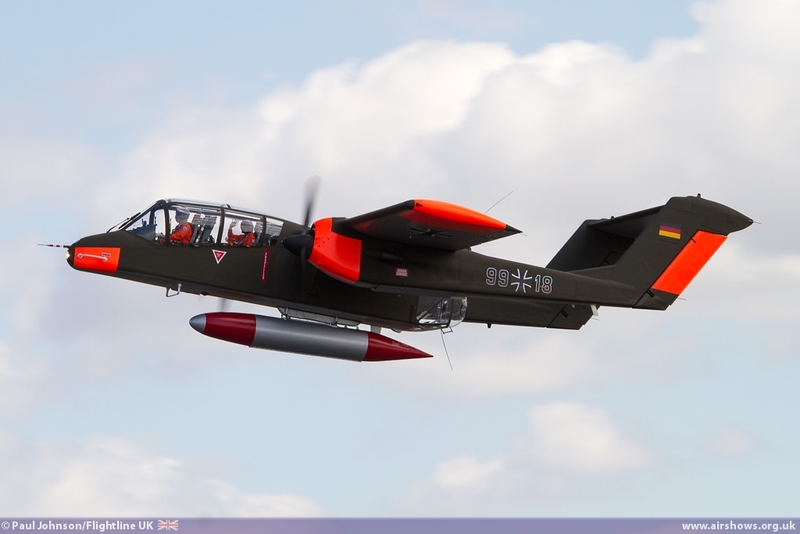 The Flight Test Centre (RSV) sent four separate solo displays. 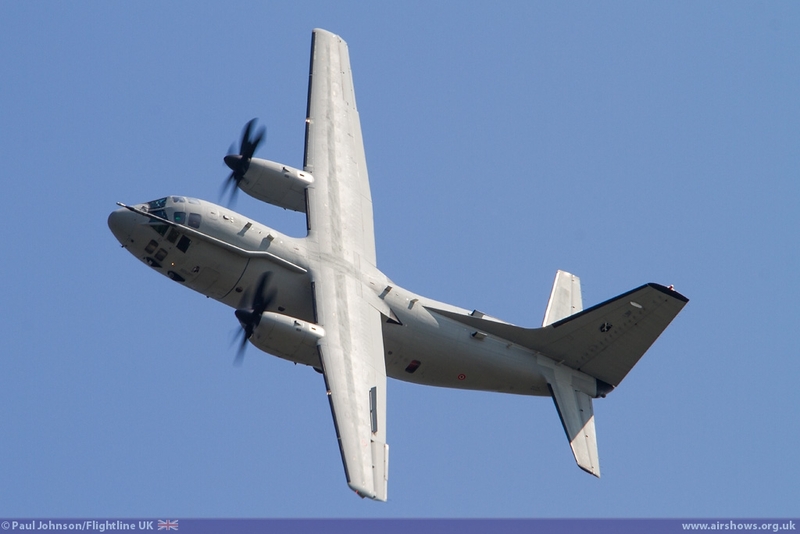 The Alenia C-27J Spartan's aerobatic routine has become a RIAT favourite showing off the exceptional qualities of the cargo-lifter. 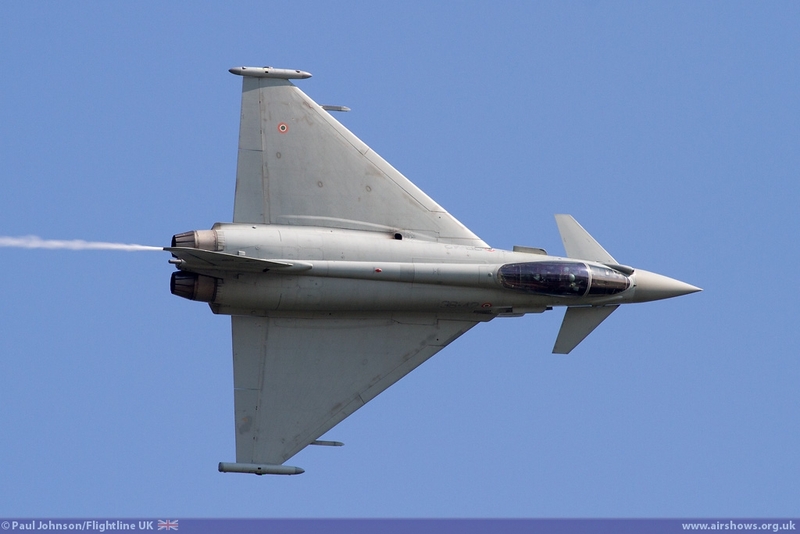 It was also great to see the RSV's F-2000 Typhoon back in the display which certainly highlighted the types impressive turn of speed and agility. 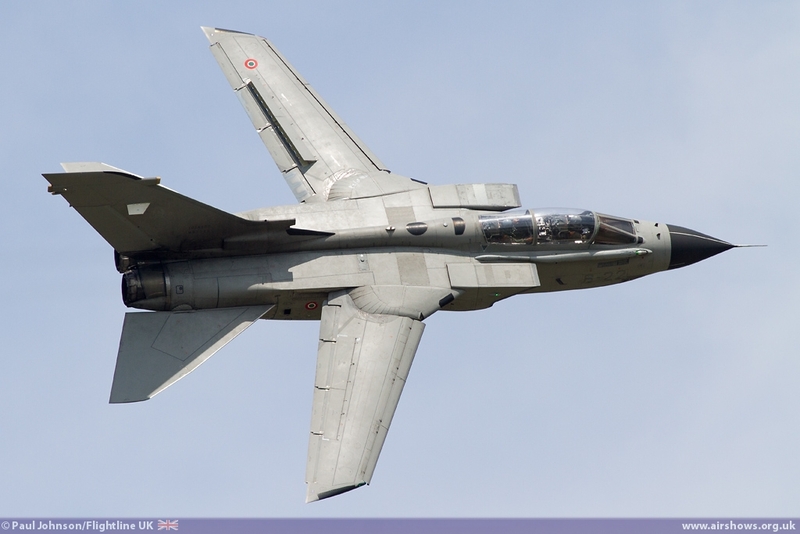 But most welcome were routines from the Panavia PA200 Tornado and the Alenia A-11 (or AMX). 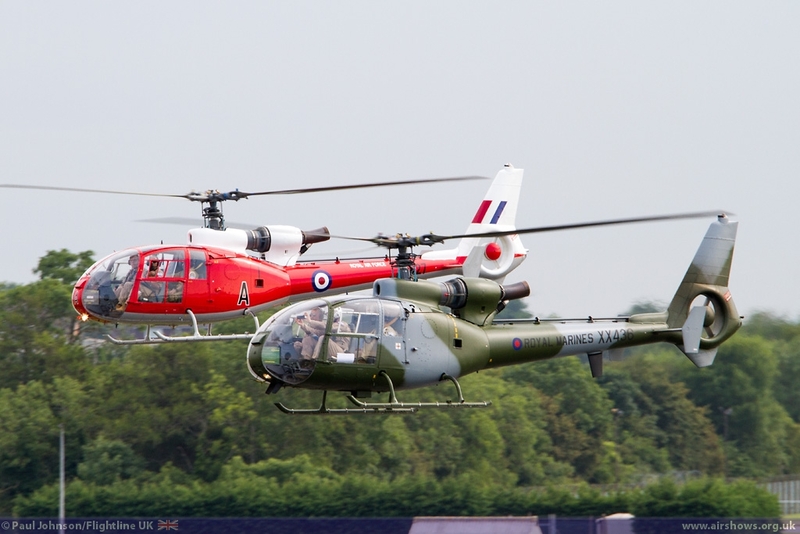 Both are somewhat older types and rare inclusions on modern flying display programmes and the RSV pilots all put in superb routines. 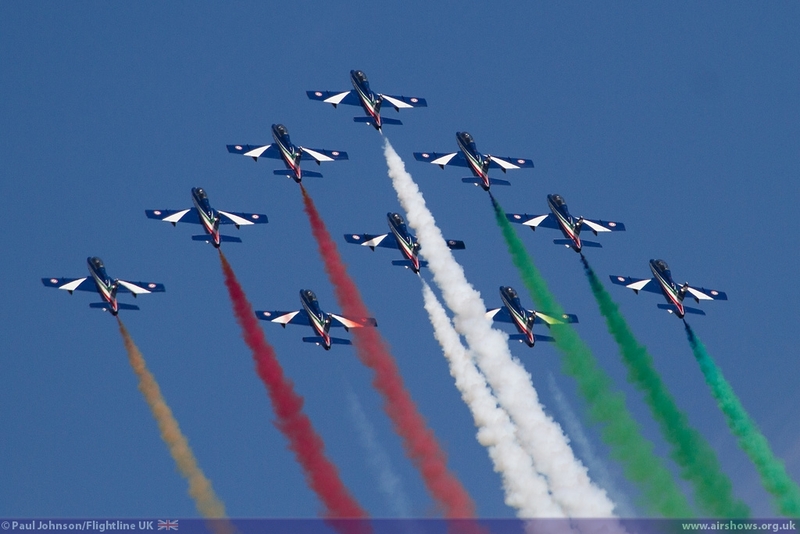 Completing the impressive Italian contingent were the Il Frecce Tricolori aerobatic team flying their ten AT-339PAN trainers. 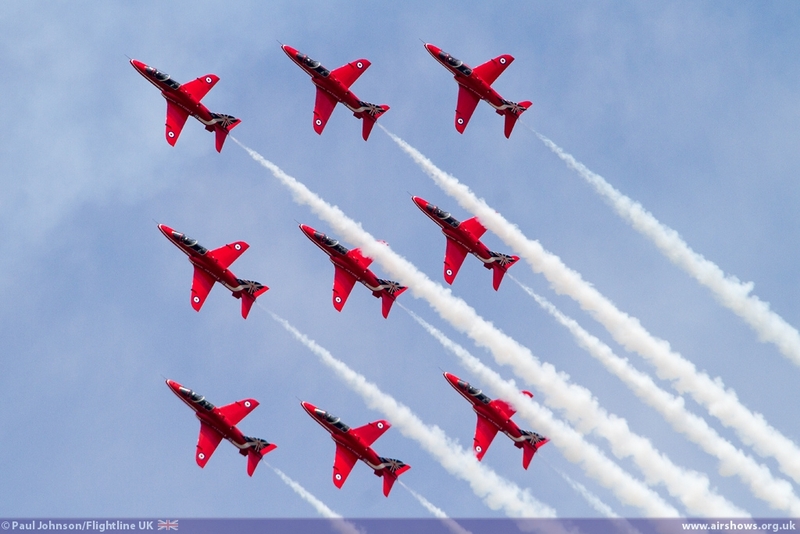 The team won the The Lockheed Martin Cannestra Trophy for the Best Flying Demonstration and Major Jan Slanger commented "It's an honour and a pleasure, especially in the 50th anniversary of the Red Arrows. 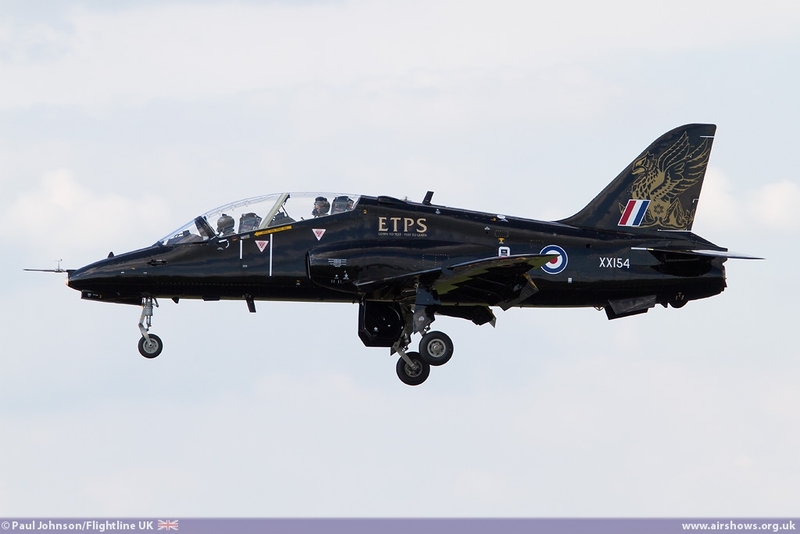 We're part of the same family of all the display teams representing the professionalism of our armed forces in the service of our nations and the international community." 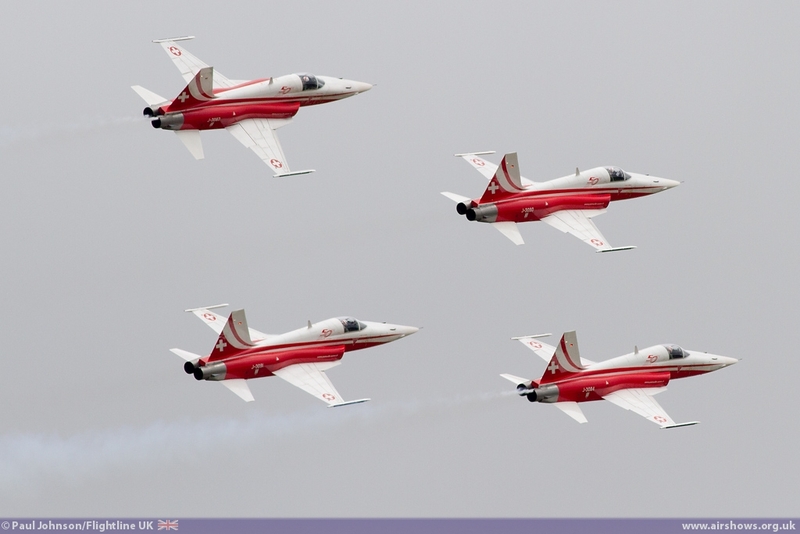 The Swiss Air Force is celebrating 100 years of Military Aviation in 2014 as well as the 50th Anniversary of the Patrouille Suisse Aerobatic Team and the 25th Anniversary of the PC-7 team. 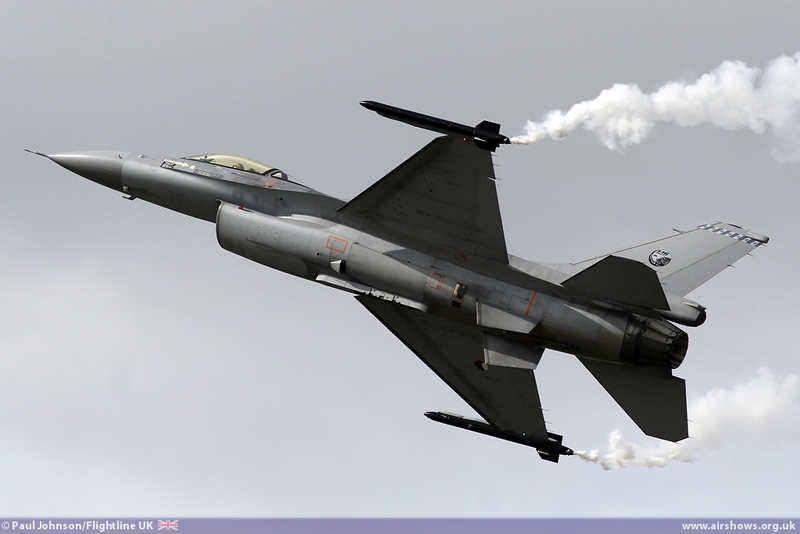 The relatively small air arm sent three different displays to RIAT. 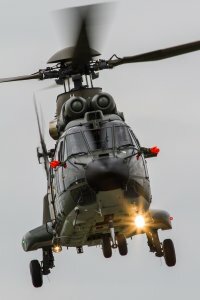 The Super Puma display team gave an excellent account of the AS332 Super Puma utlity helicopter with some impressive manoeuvres close into the crowd. 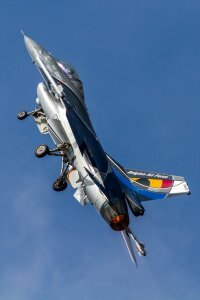 The solo F/A-18C Hornet flown by Julien "Teddy" Meister continued his UK tour (he's also due to display at Yeovilton having already appeared at Waddington) with another powerful display. 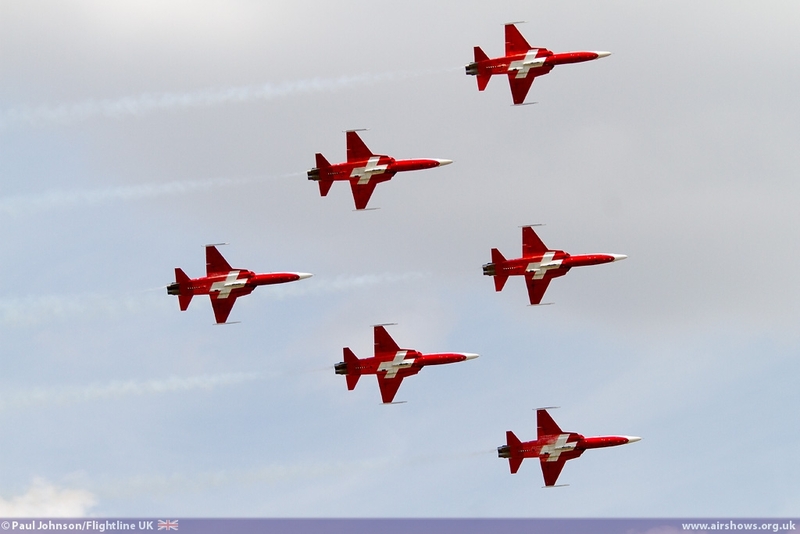 Completing the Swiss line-up were Patrouille Suisse. 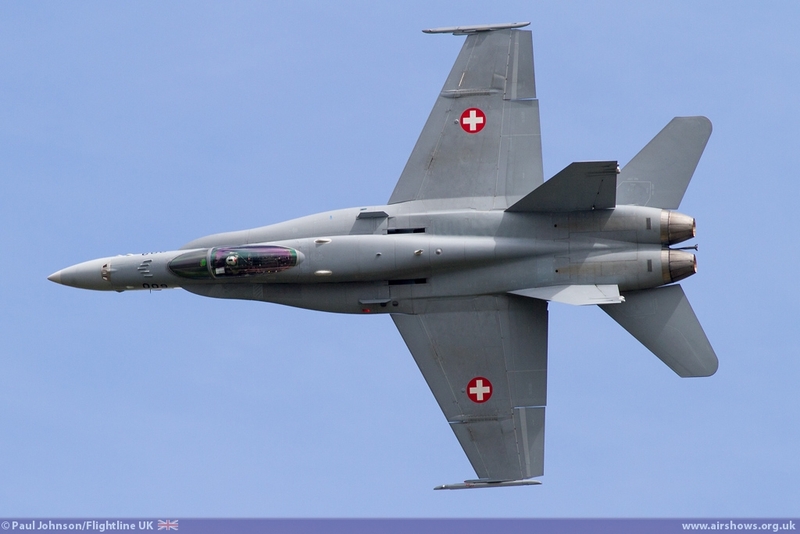 With the imminent retirement of the Northrop F-5 Tiger II from Swiss Air Force service and the lack of public support for the purchase of replacement Gripens, this could well have been the Patrouille's final appearance at the Tattoo. 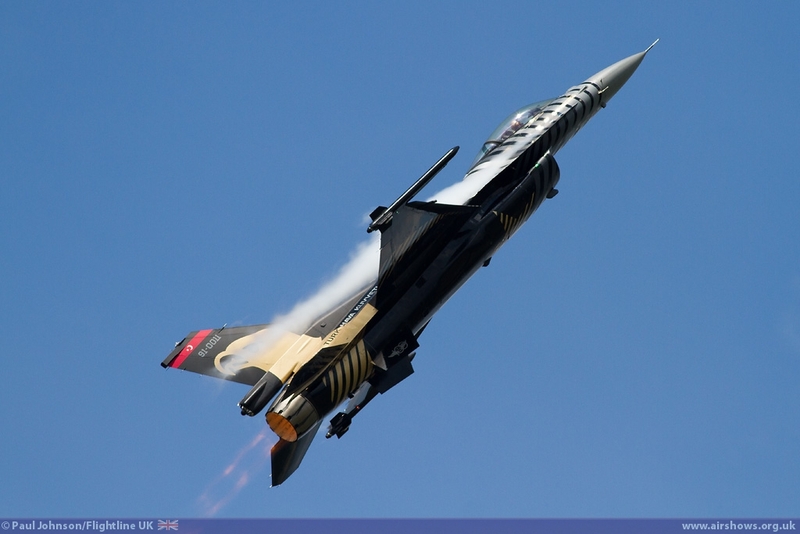 We hope not as their display is always an impressive mix of precision and noise. 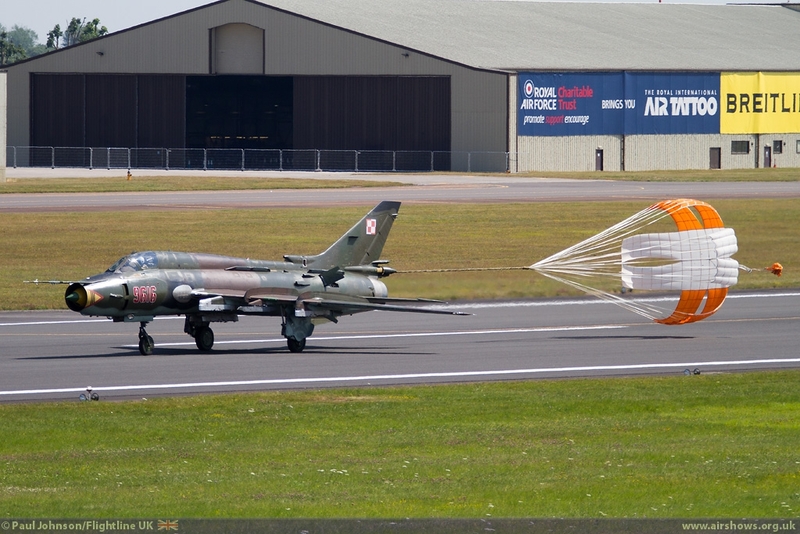 The team had hoped to form up with an original Patrouille Suisse Hawker Hunter F58a . 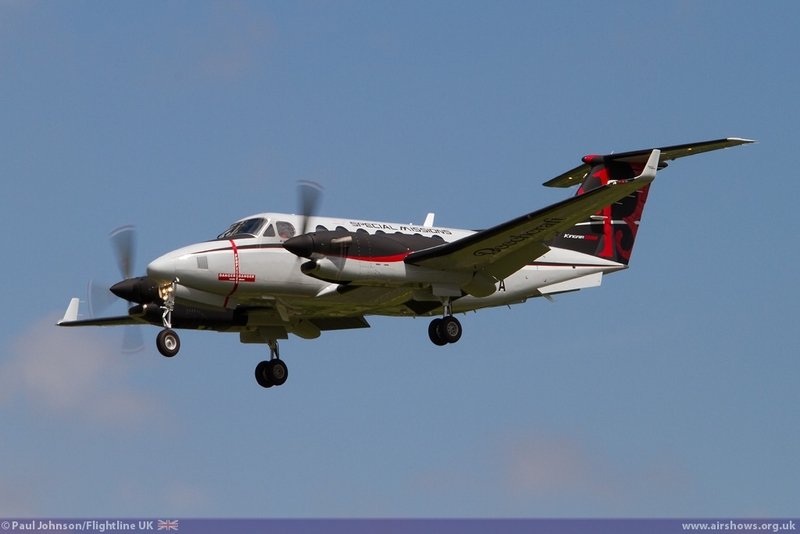 Sadly, poor weather across Europe prevented the aircraft making the transit. 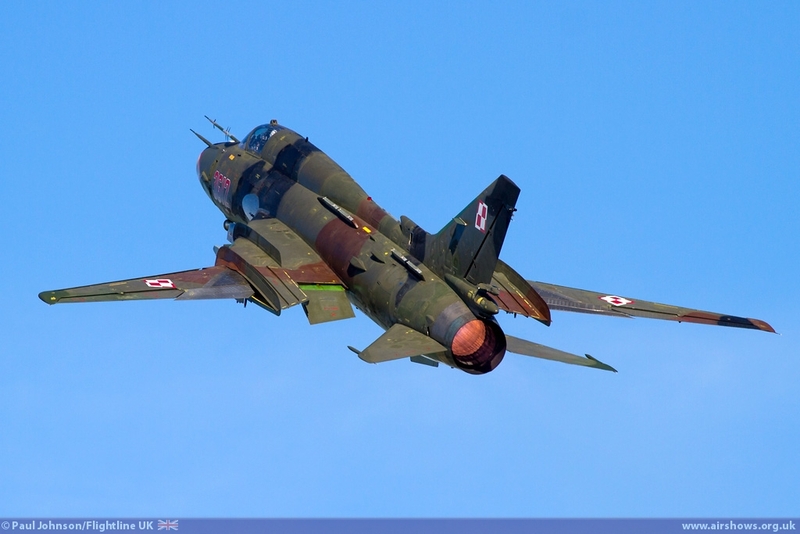 The Polish Air Force were also on show in force. 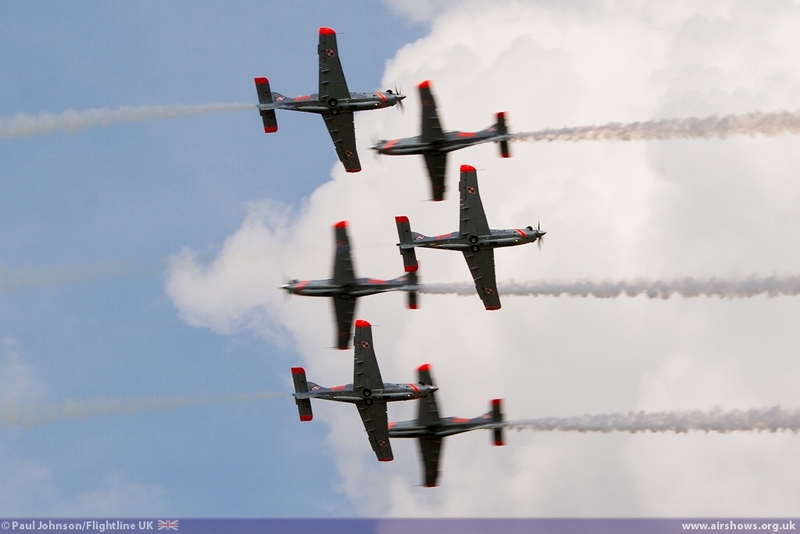 The Orlik Aerobatic Team made a welcome return to the Tattoo after a gap of several years. 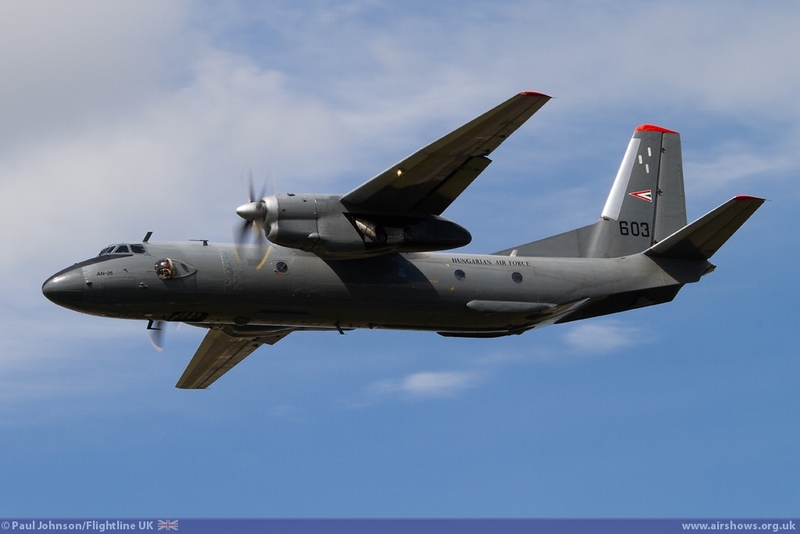 The team, which made its UK debut at RIAT have come a long way expanding the team numbers and developing the display with their PZL Orlik turboprop trainers. 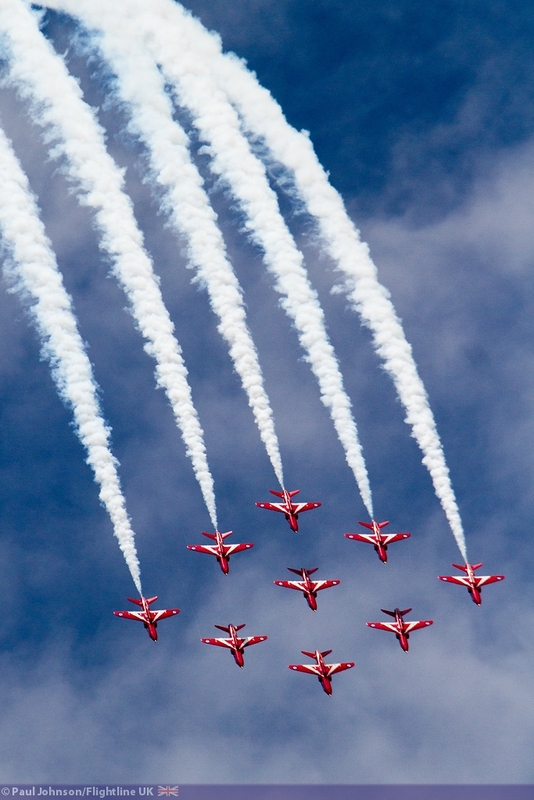 Most impressive were the teams close formation take-offs and landings with all seven aircraft. 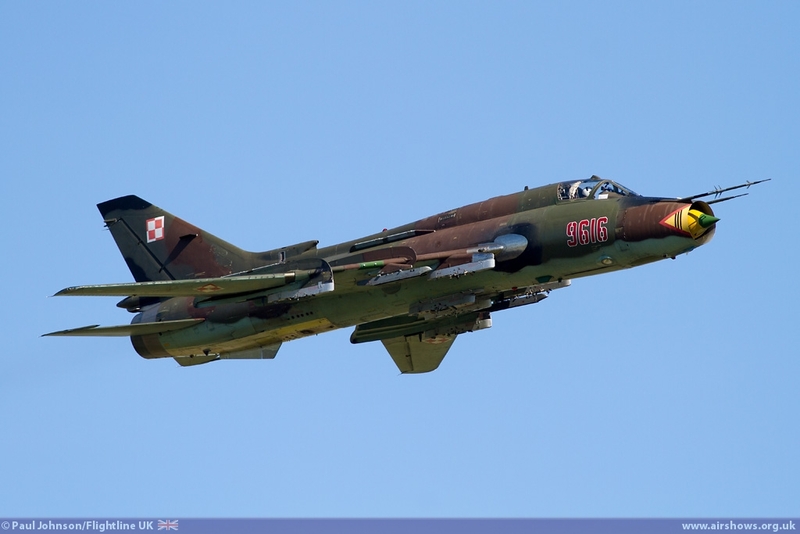 However it was the pair of Polish Air Force Sukhoi Su-22M4-K "Fitter" strike aircraft that were the overall show highlight for many. 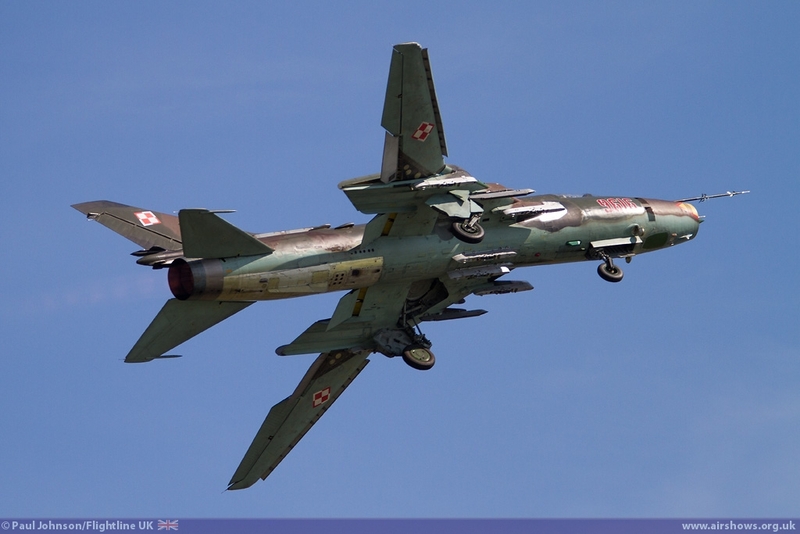 The sight of these Cold War era Soviet built aircraft is really what the Air Tattoo has been all about ever since the Czechoslovakian Air Force first started appearing at IATs in the early 1990s. 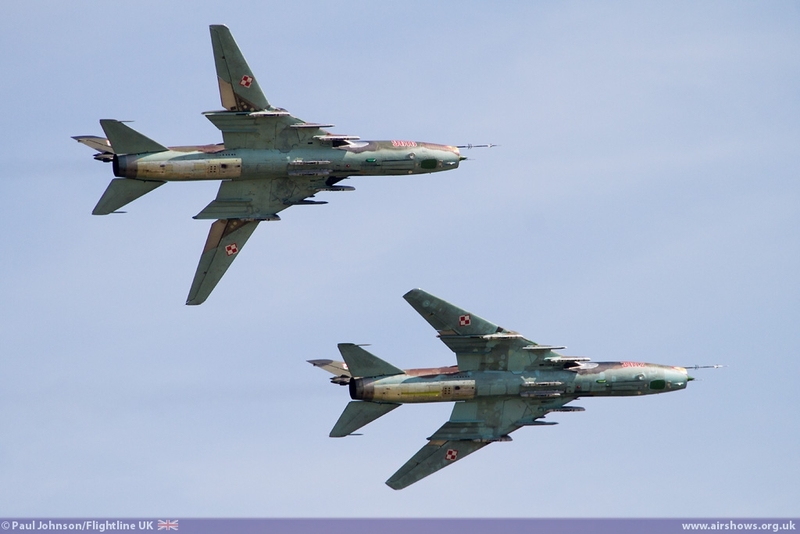 The pair flew a relatively simply sequence starting with formations showing the various wing sweep angles before entering more of role demonstration of various tactics employed by the type. 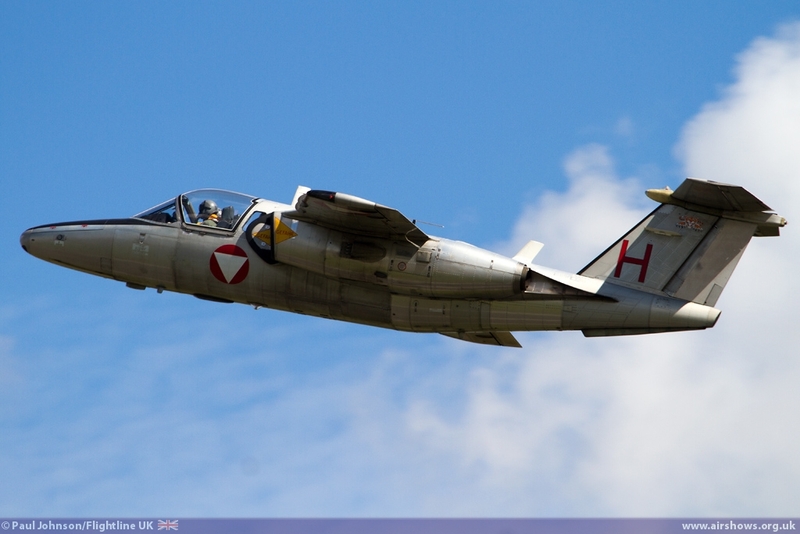 The display concluded with some dramatic missed approaches along fairford runway highlight the immense presence of these aging Cold War warriors to the crowd. 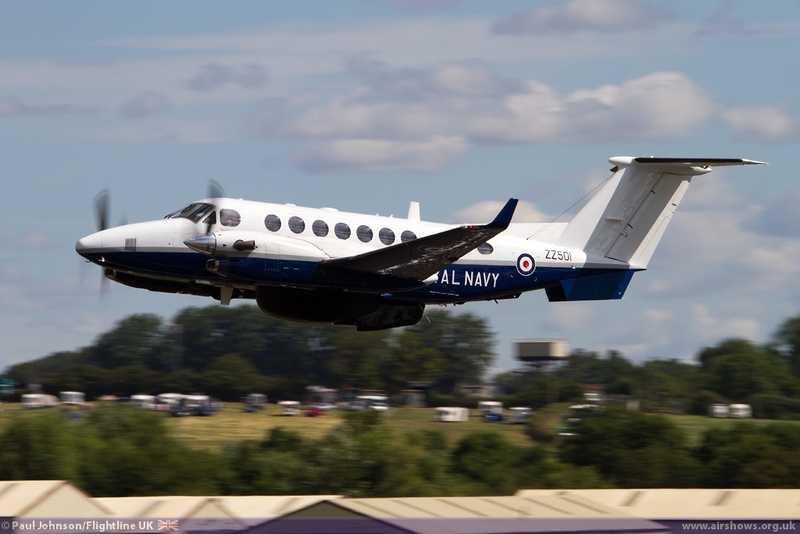 The team won the As the Crow Flies Trophy, awarded for the best overall flying demonstration as voted for by the Friends of the Royal International Air Tattoo. 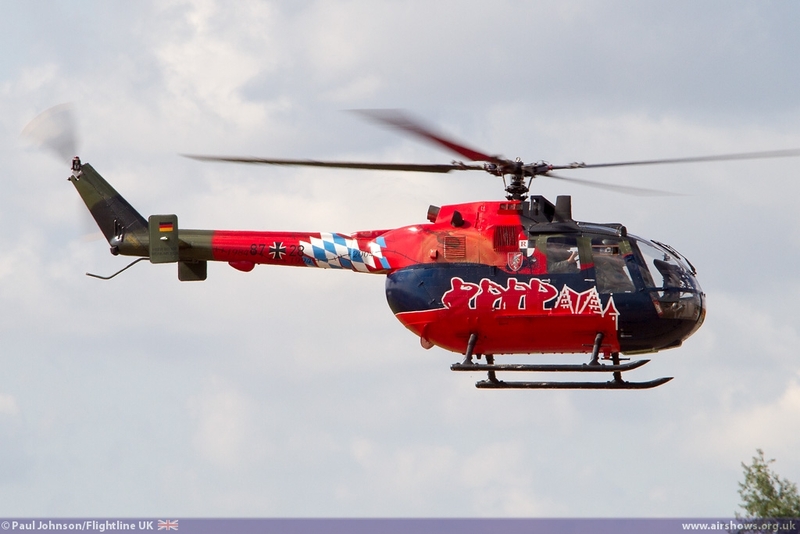 Team Leader Major Mejka said "This is very special for us. 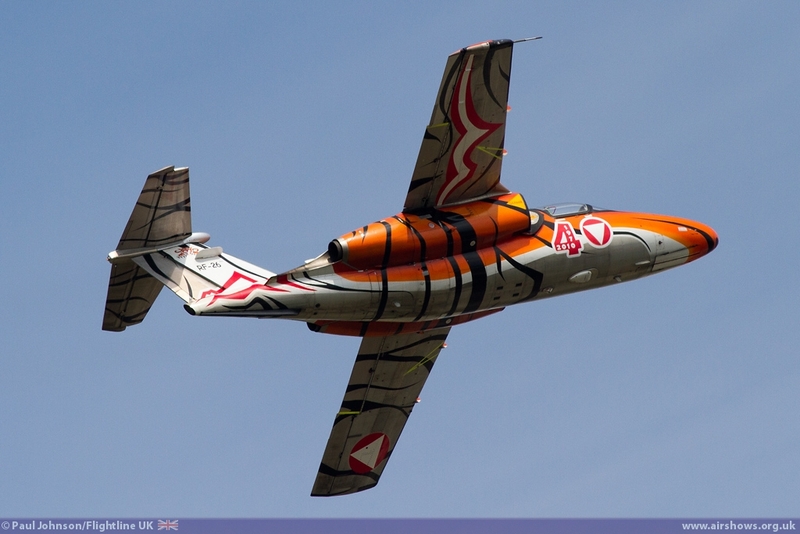 It has been an amazing weekend at the biggest airshow of all, and this is the first prize we have won!" 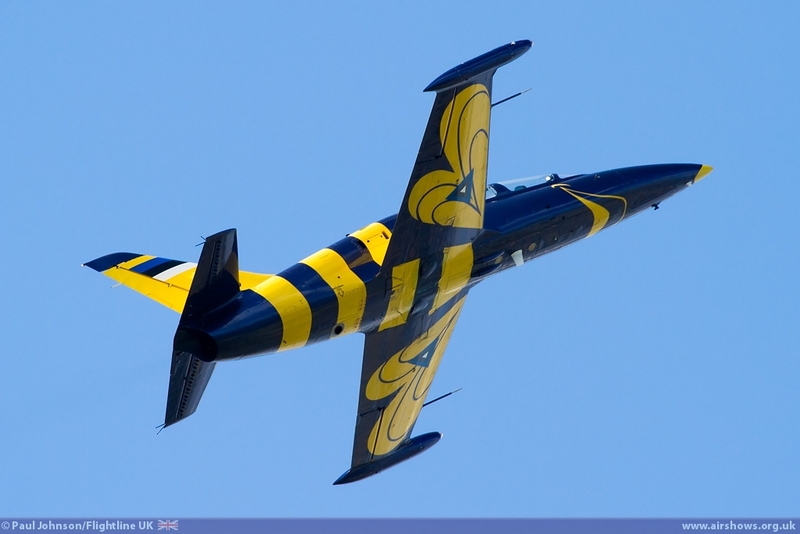 Further Eastern European displays came from the Estonian Air Force with the welcome return of their colourful Aero Vodochody L-39C Albatros jet trainer. 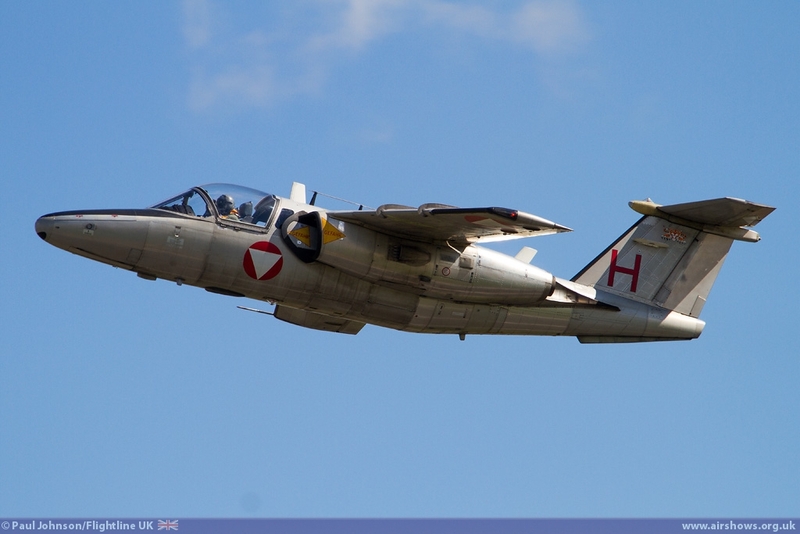 Estonia have perhaps the smallest Air Force in Europe with just two L-39s leased from a Latvian company flying alongside a modest fleet of Antonov An-2 Biplanes and Robinson R22 helicopters. 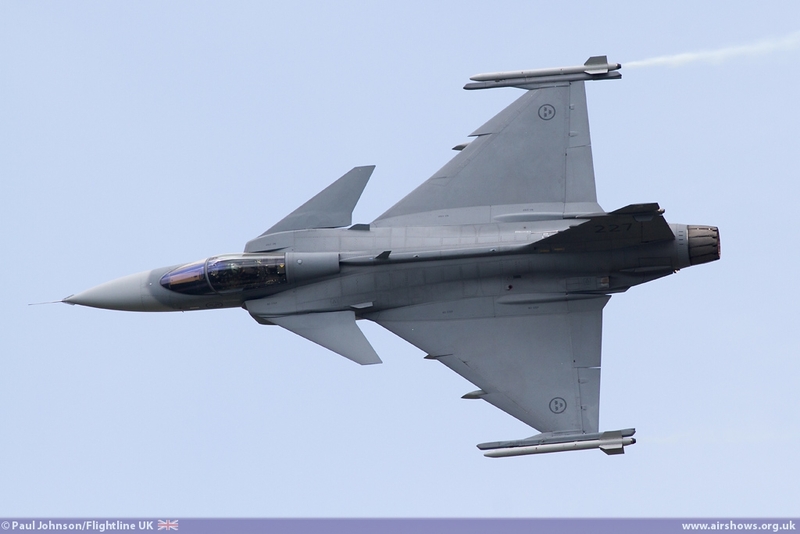 The Swedish Air Force sent the SAAB JAS-39C Gripen solo display which is always a very punchy performer with a very energetic routine showing off the superb turn of speed. 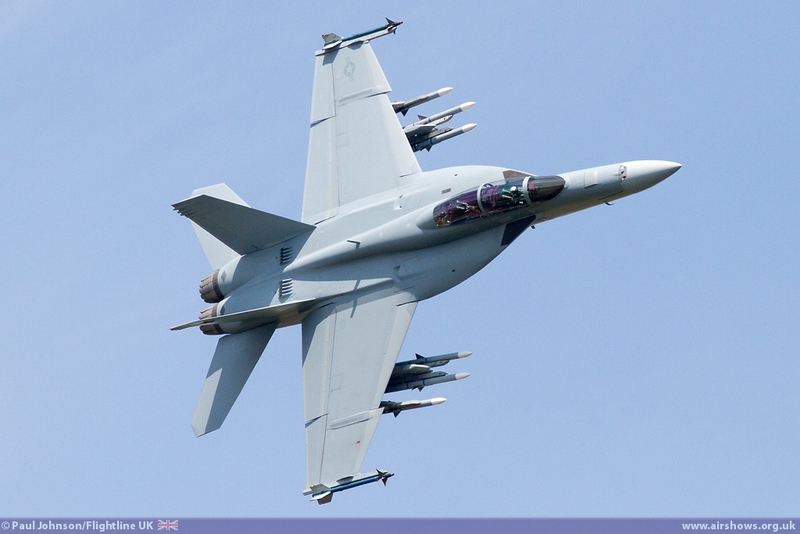 Saturday also saw the US Navy F/A-18F Super Hornet displayed by a Boeing Test Pilot. 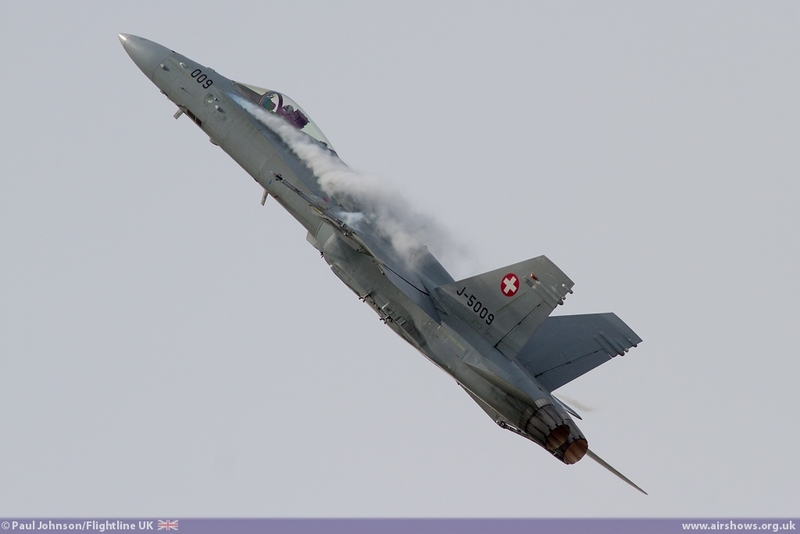 Primarily over in the UK for Farnbnrough, the display was overly high and distant particularly when compared to the old Swiss "Legacy" Hornet and seemed rather lost in Fairford's big sky. 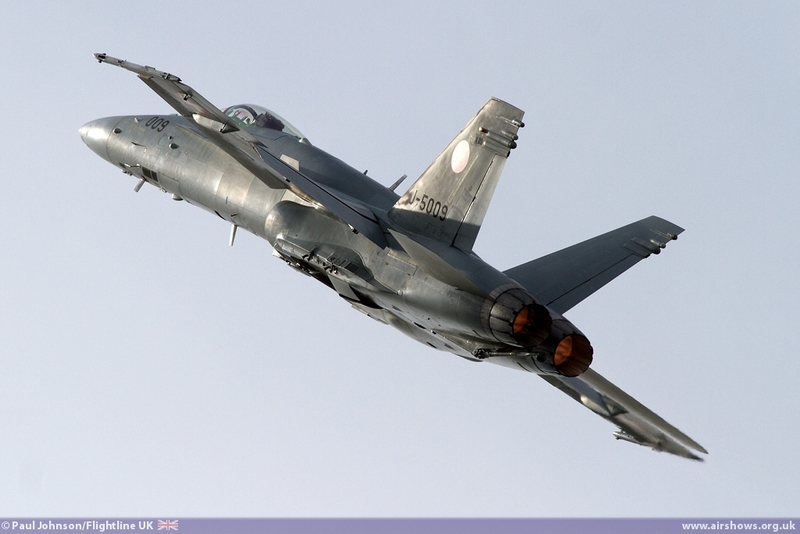 Due to pilot availability, the Super Hornet was unable to display on the Sunday. Completing the salute to the Red Arrows 50th Display Season were a number of display teams. 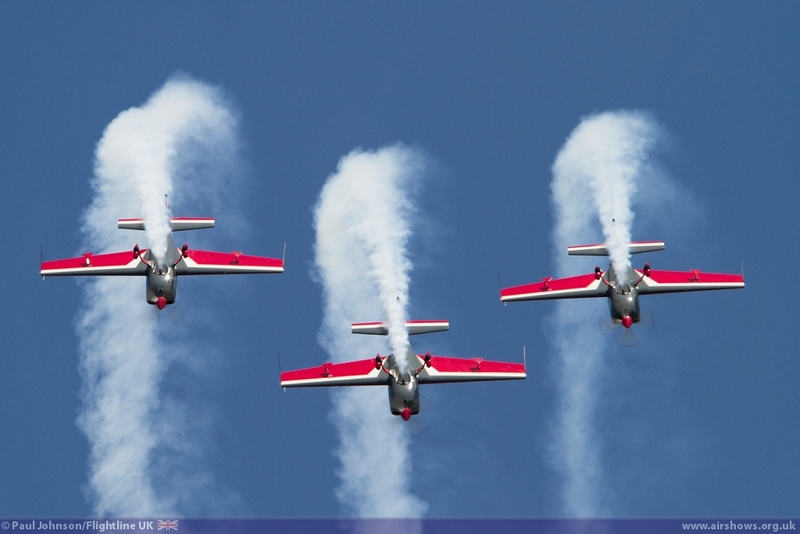 The Royal Jordanian Falcons continued their European Tour with their traditional stop off at RIAT presenting a three ship routine. 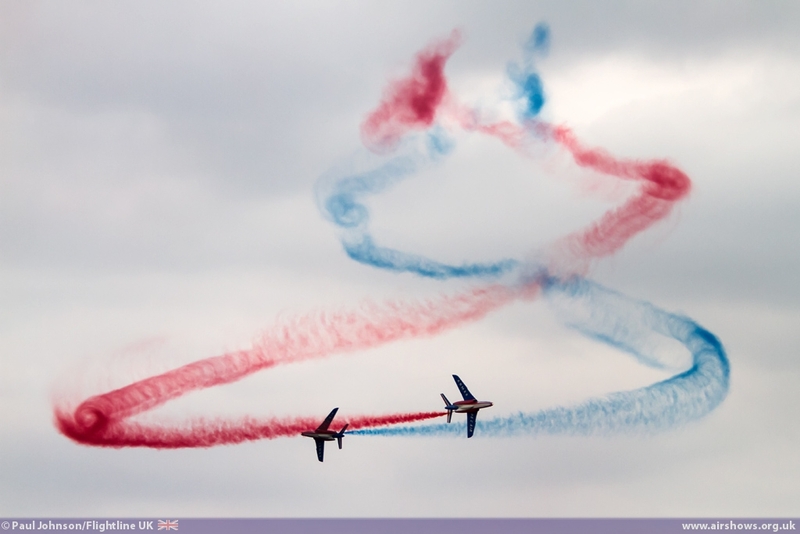 The only French Air Force participants in the whole show were La Patrouille de France. 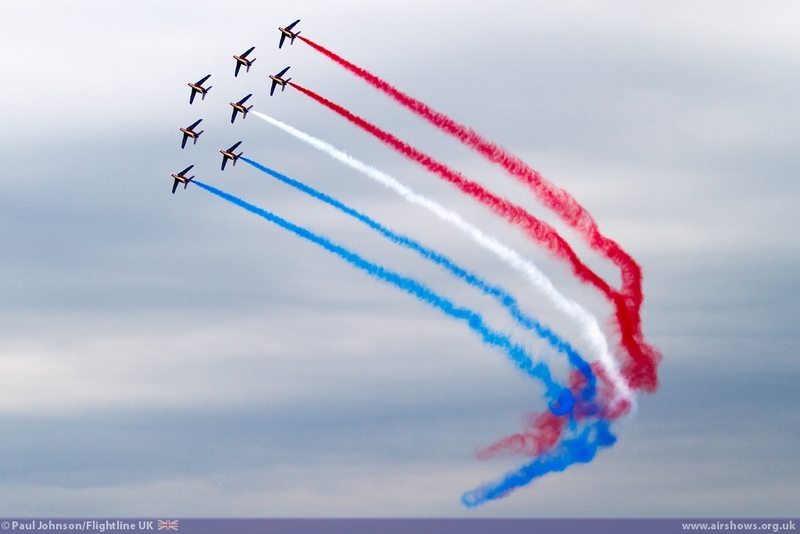 The Air Tattoo weekend coincided France's Bastille Day celebrations which meant their military was quite stretched supporting their important national event. 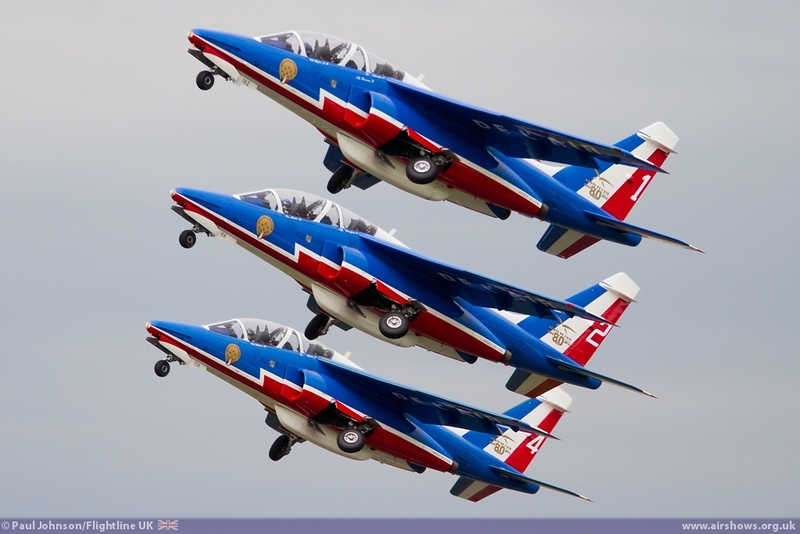 However the Patrouille de France did perform on the Friday and Saturday presented a wonderfully elegant and photogenic routine of formation aerobatics in their pretty Alpha Jet Es. 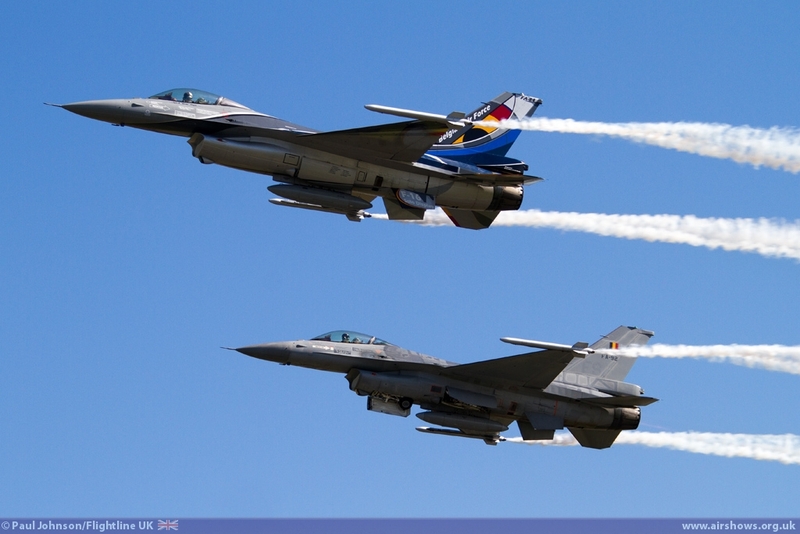 The 40th Anniversary of the F-16 Fighting Falcon was particularly well represented in the flying display with three of Europe's best F-16 solo displays. 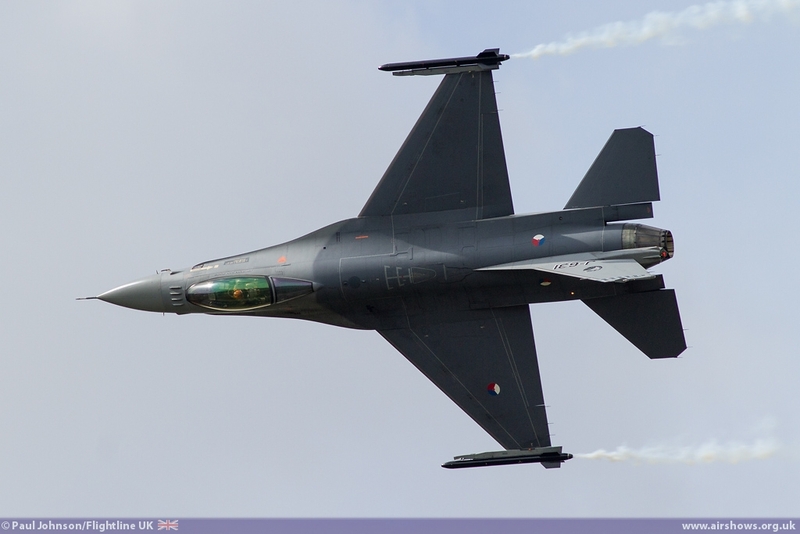 The Royal Netherlands Air Force F-16AM Fighting Falcon solo display is something of a tradition at RIAT. 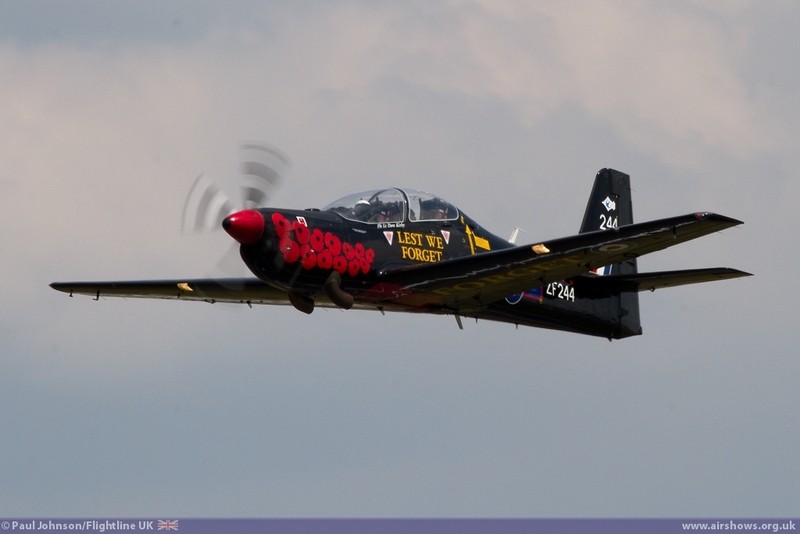 This year sees a new pilot, Capt Jeroen 'Slick' Dickens from 323 Squadron take off the role of solo display pilot. 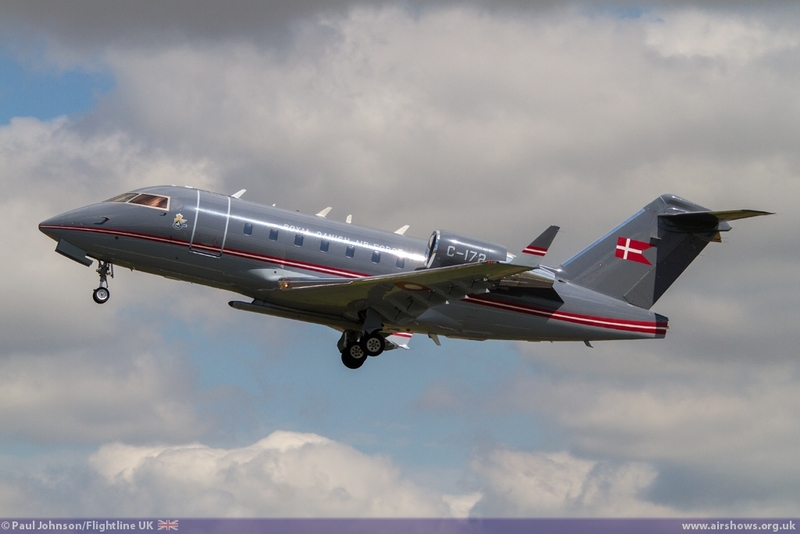 The team are also without a specially marked jet using a standard grey jet. 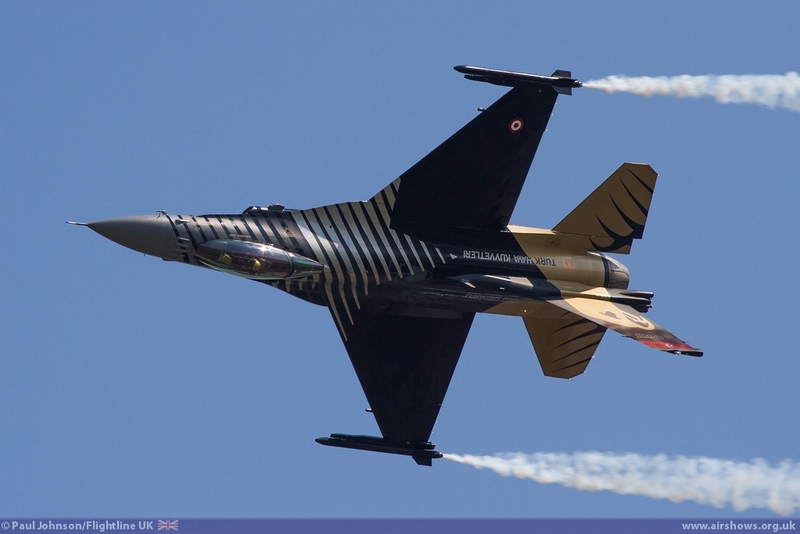 RIAT also saw an appearance from the Turkish Air Force F-16C solo display "SoloTurk." 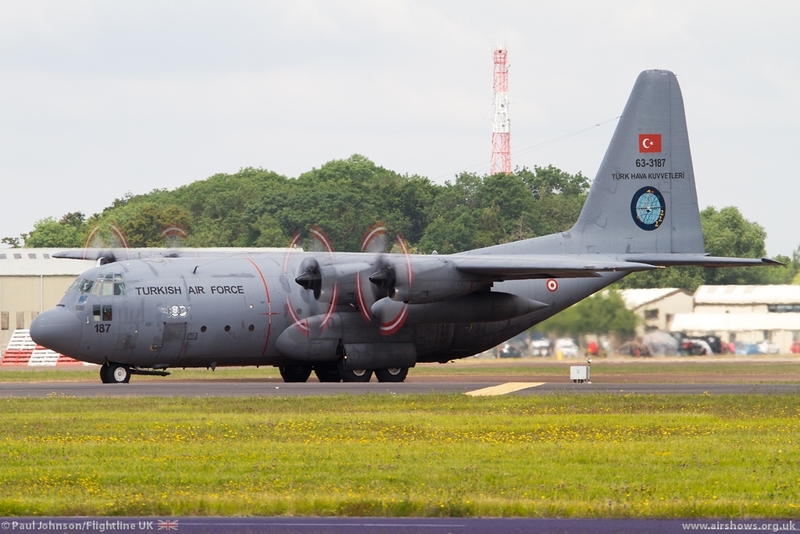 The Turkish team were on a mini UK Tour having appeared at Waddington the week previous. 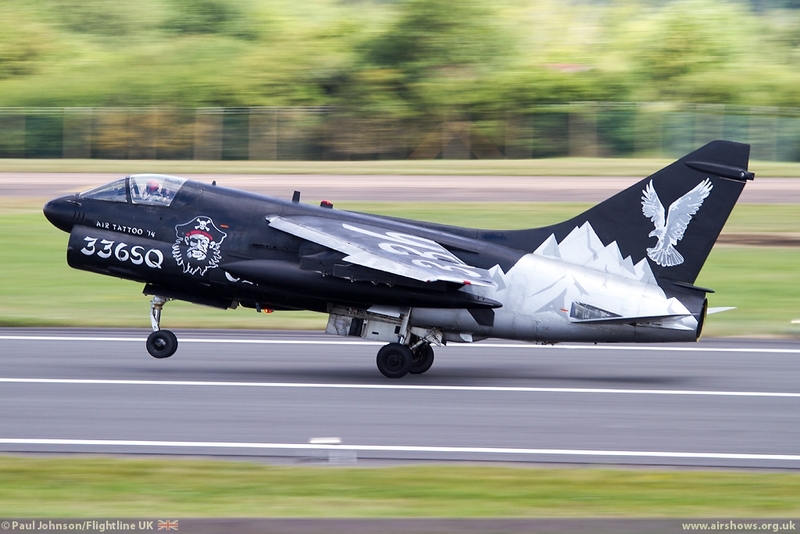 Their display is certainly one of the most engaging to watch with a stunning paint scheme, liberal use of wingtip smoke and a very enthusiastic commentary. 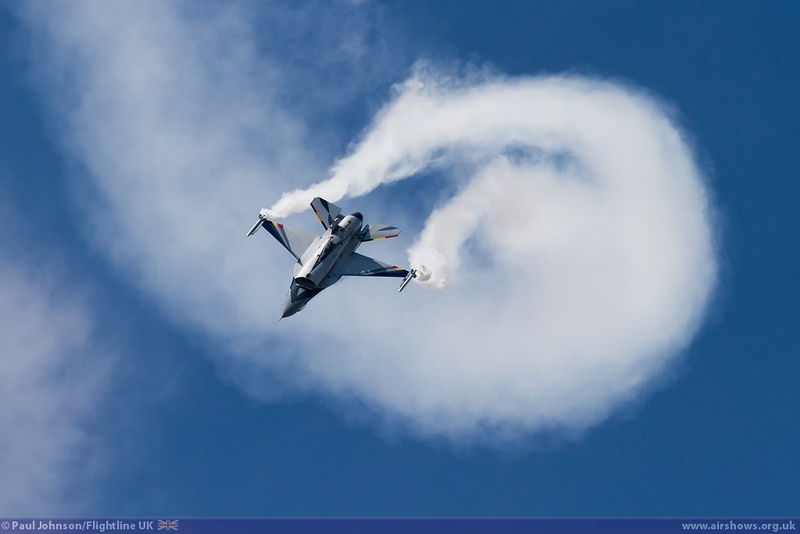 However the pick of the F-16 displays was that given by Commandant Aviateur Renaud 'Grat' Thys from the Belgian Air Component. His display was a master-class in keeping a big jet close in the crowd with a very nice flowing display, particularly during Sunday's early poor weather. 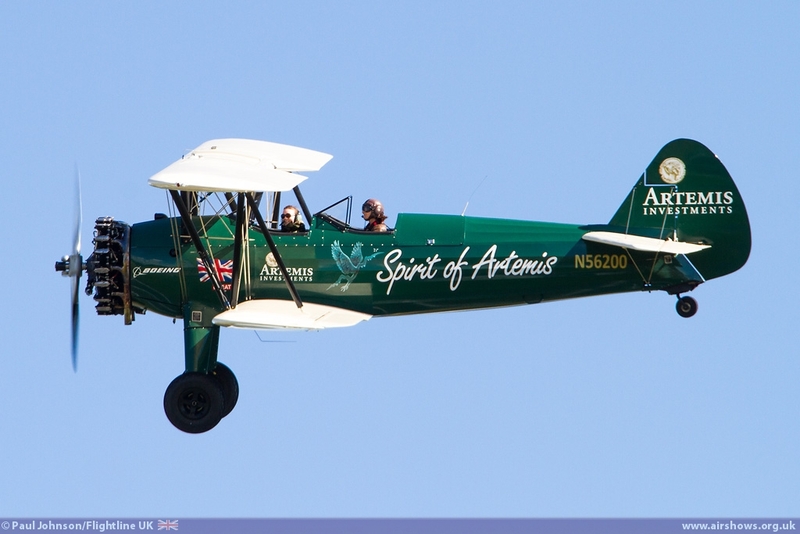 His display was recognised by the Flying Control Committee who awarded him the Sir Douglas Bader Trophy presented for the Best Individual Flying Display. 'Grat' said said: "It's great and a huge personal accomplishment for me. 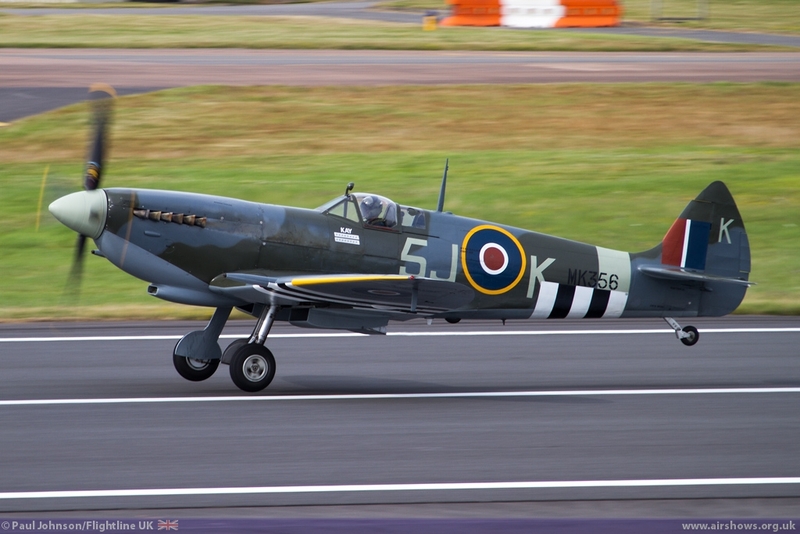 It really does mean a lot, and to receive a trophy in my last display season, and in the name of Sir Douglas Bader, is humbling." 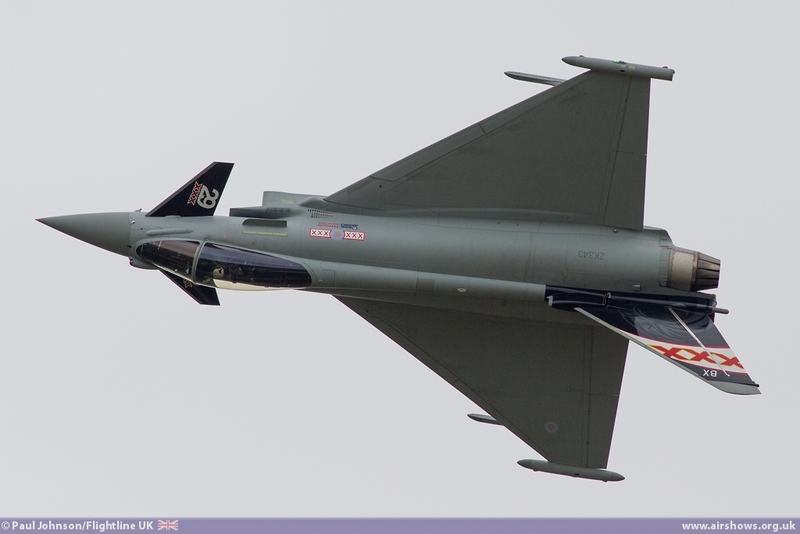 2014 saw the Air Tattoo continue to develop and adapt to the new world it find itself in. 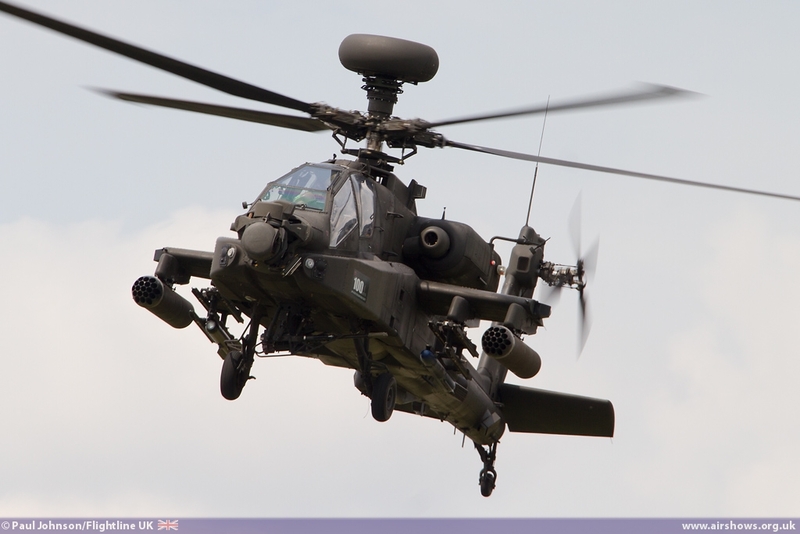 With innovations such as the Air Tattoo CREW, the Service Stations and the Vintage, Techno and Adrenelin exhibition zones on the ground plus a very full eight hour flying display and a large (when compared to similar airshows in the UK and Europe) static display RIAT still offers the most exciting and packed of aviation family days out over the Saturday and Sunday. 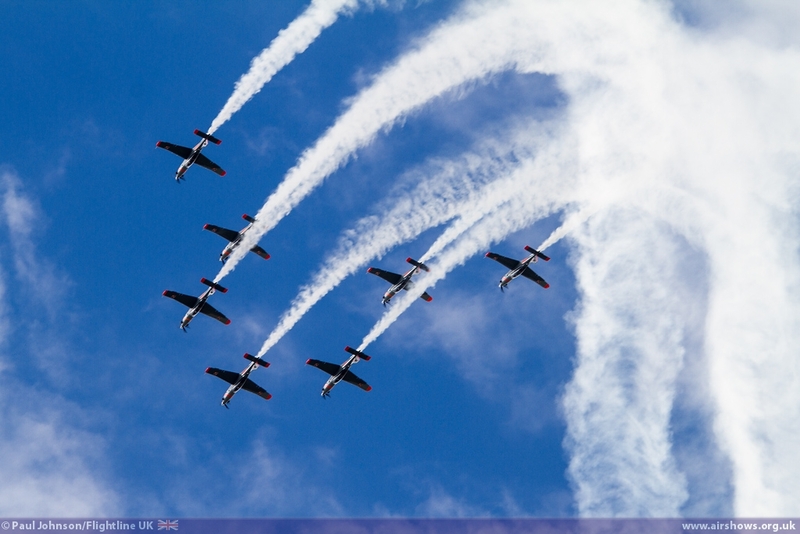 The flying display is certainly a truly excellent spectacle and certainly kept everybody entertained for over eight hours backed by some great commentary. 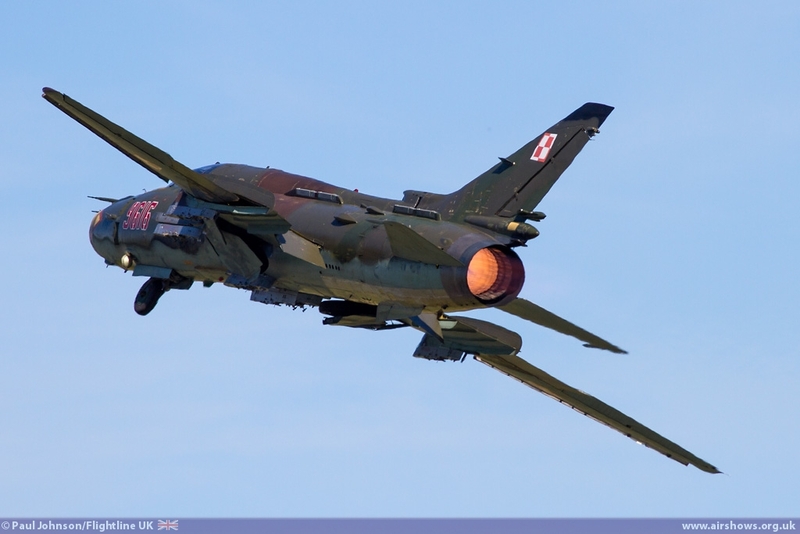 The numbers of aircraft available to the Air Tattoo static is much smaller than ten years ago, but there is still a good amount of quality in there with the likes of the Japanese ASDF, Polish Air Force and participation from the Middle East. It is just a shame that with the shrinking showground, some areas of the static did seem rather more hemmed in by stalls and fun fairs than usual! The new Friday opening however was much less successful. 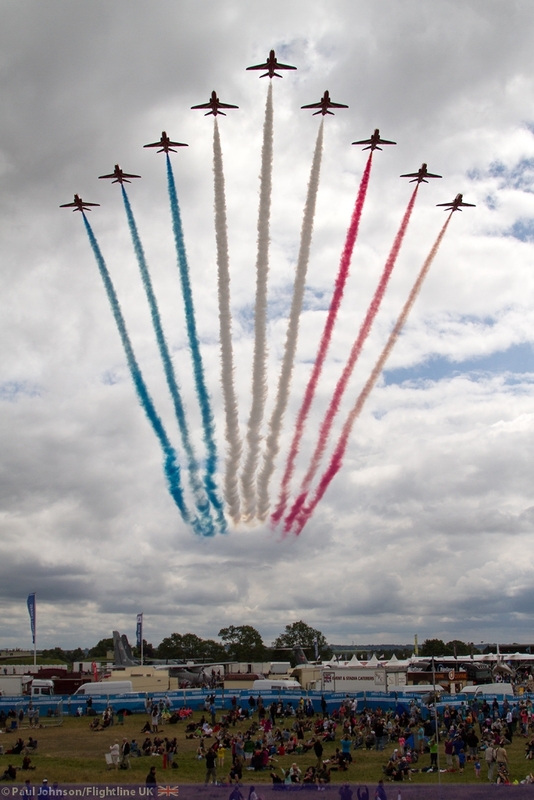 While it did offer the overall highlight of the weekend with the Red Arrows flypast with the leaders of the other jet teams, it did not gel as the quality event we have come to expect from the Air Tattoo. 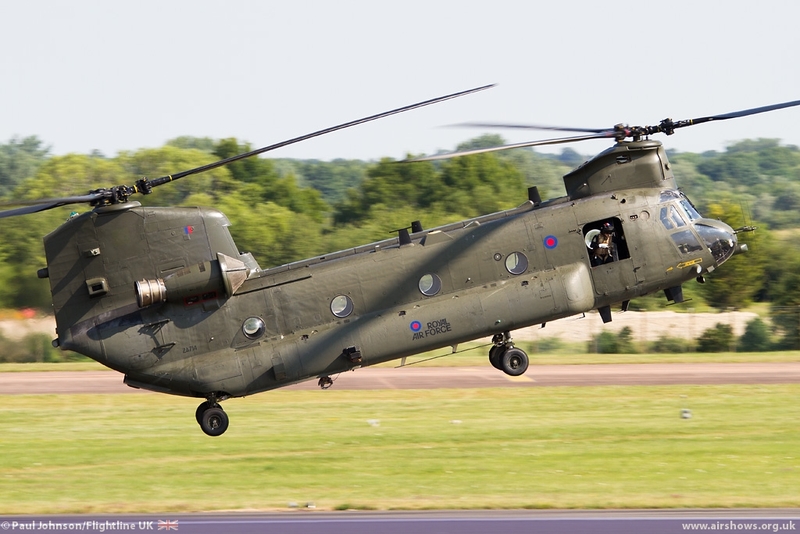 If, as it seems, the Friday opening is to become a permanent fixture more work needs to be put in to ensure it feels like a quality event and does not detract from the Air Tattoo brand and the full show offered over the weekend. 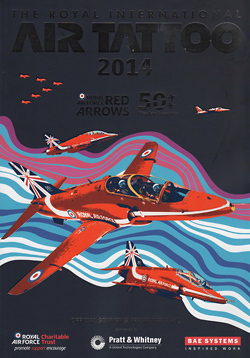 Another gripe concerns the Souvenir Programme - they are for many an essential purchase at any event but with the RIAT 2014 programme weighing in at a whopping £12, one has to question whether that really is value for money when many of the benefits to the programme could be obtained for free via the official FREE mobile app! 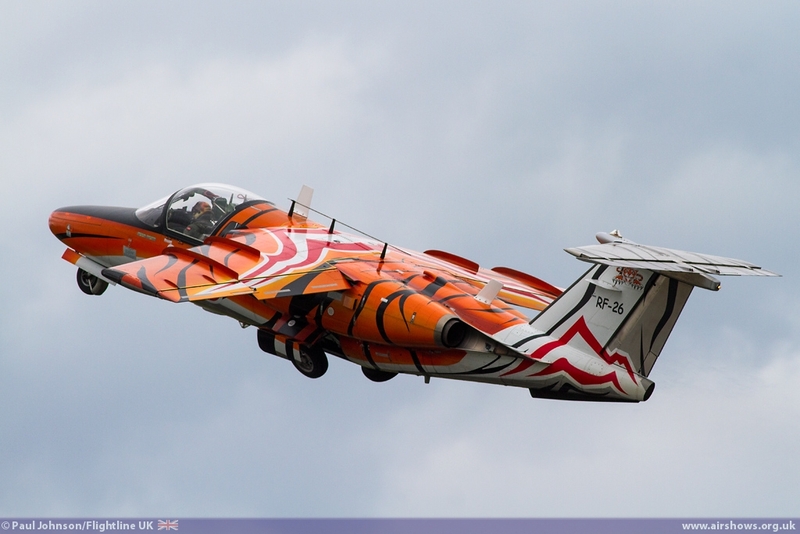 RIAT 2014 was though very much an end of an era being the final show organised under the directorship of Tim Prince. The week after the event, RAF Charitable Trust Enterprises saw Andy Armstrong step into the Directors role. 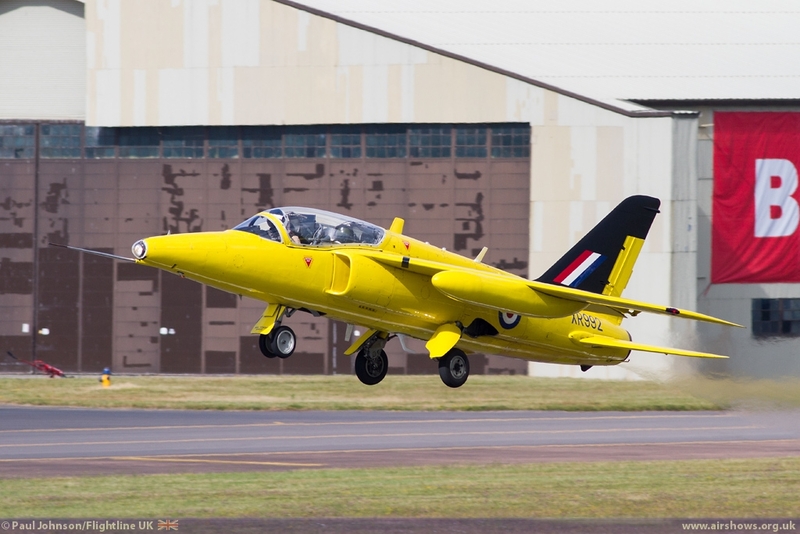 At the post show Hangar Party, Air Marshal Sir Kevin Leeson, Chairman of the Royal Air Force Charitable Trust and President of RIAT, paid tribute to Tim. 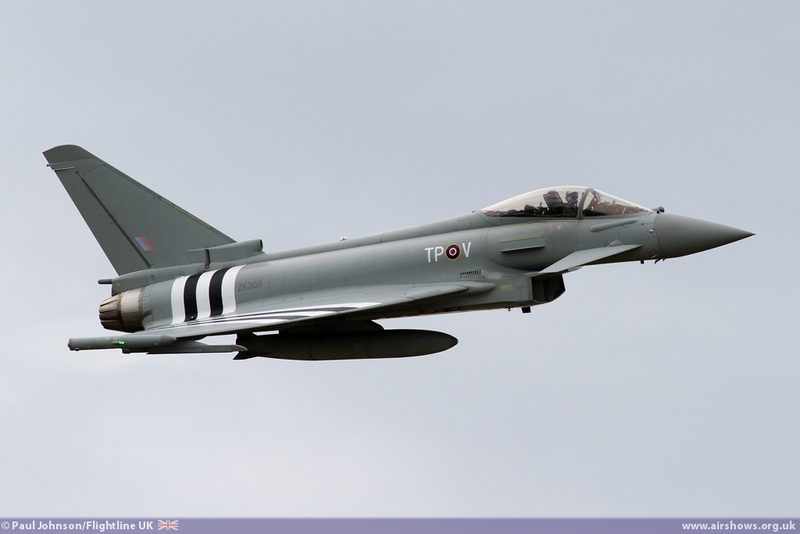 "Tim has given most of his working life to the Air Tattoo and to aviation more widely, and I'm sure we all want to wish him well in his retirement. 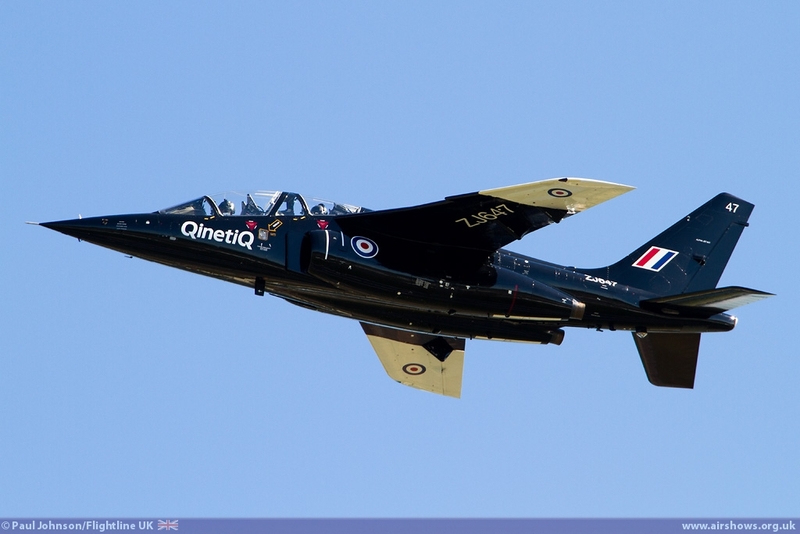 The RIAT family is very sad to see Tim moving on: he will hand over to his successor Andy Armstrong later this week, and Andy is looking forward to continuing the tradition of excellence and delivering the kind of displays and shows that Tim has established as his record. I know all of you will wish to recognise Tim's outstanding achievements of 43 years of unstinting dedication and imagination in showcasing the brilliance of aviation and caring for its people." Tim was presented with the RIAT Sword of Merit by Alan Smith, Chairman of RAFCTE. On receiving the sword Tim said "Can I just say a big thank you: I've had a great time running this event with a lot of good people - Paul Bowen and everybody that's been on the team. Many have passed on now but together we've all believed in achieving the impossible and over the years we've done some outstanding things. So my thanks goes to absolutely everybody for helping me have a great 43 years. 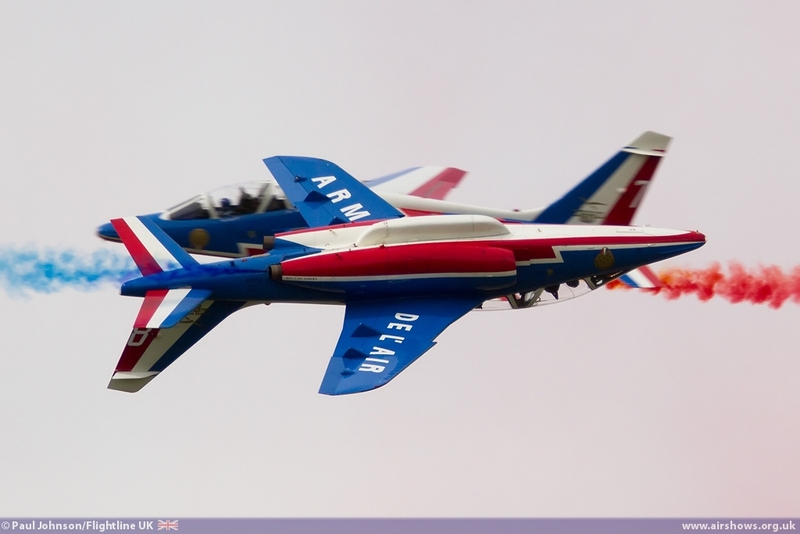 The Air Tattoo brand is now something pretty famous - long may it last." 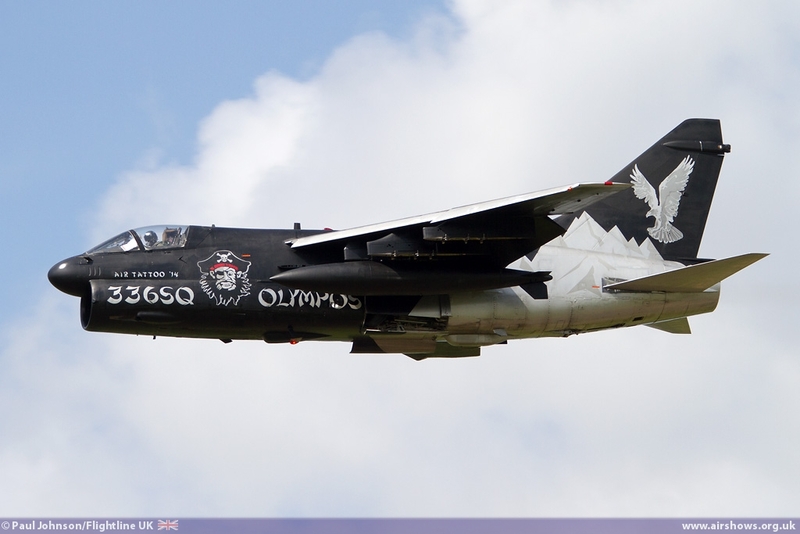 In closing this review, I would just like to add a personal thanks to Tim and all those who created and supported the Air Tattoo. 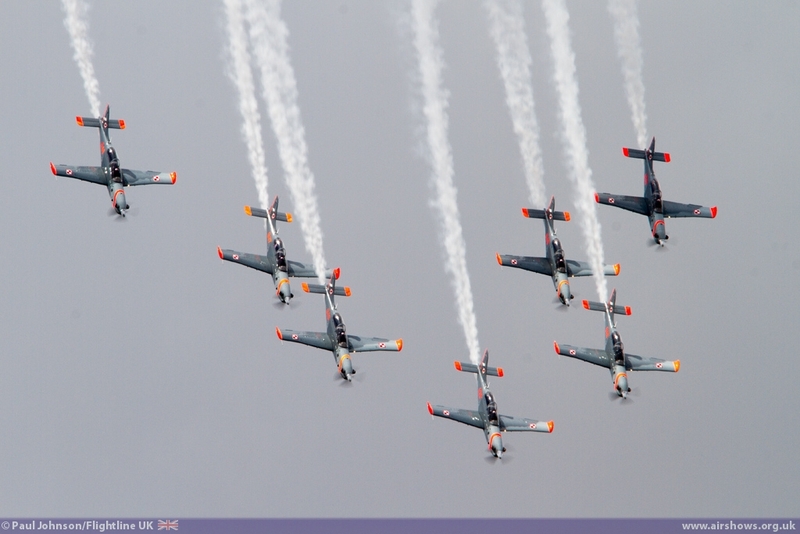 An Air Tattoo event, the TVS Battle of Britain Air Show at Boscombe Down was my first airshow and since then I've been to many RAF Fairford based Air Tattoos and the amazing Air Tournament International at Boscombe Down and they've always been memorable occasions and really kick-started my interest in airshows like they have for many others now involved with staging airshows. 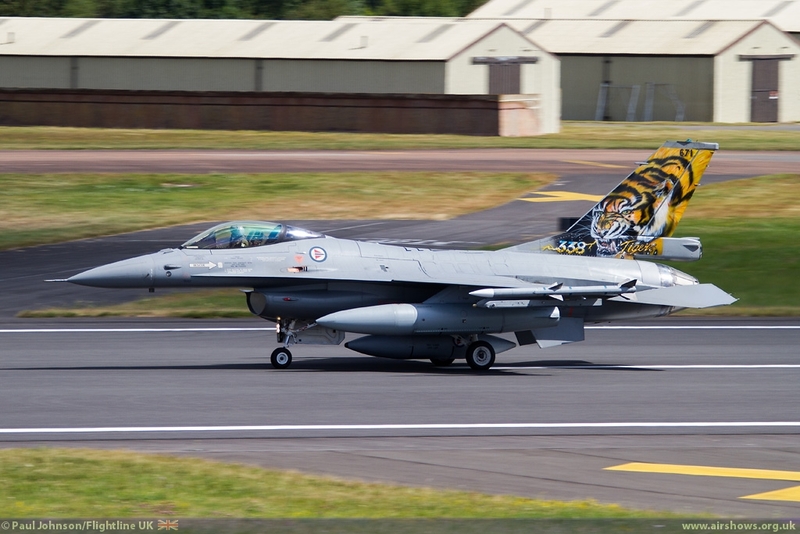 Roll on RIAT 2015! !